Posted on October 12, 2018 at 12:53 am. This week was such a blast. 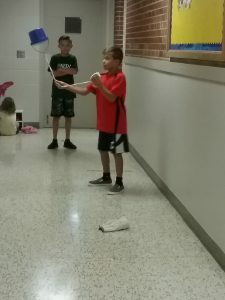 We began practicing for our play “Caps for Sale,” started making berets for the performance, went on our first Elementary only field trip, practiced hammering and drilling, and had a lot of lessons! 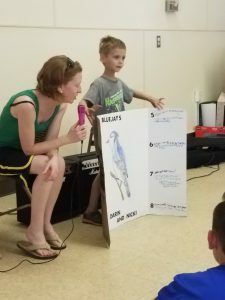 At the Cleveland Zoo, the first and second graders worked together to observe and discover what the basic needs of elephants are, while the third through fifth grade students observed elephants to find out how they spend most of their time, as well as, discussing the issue of clean water in Africa. 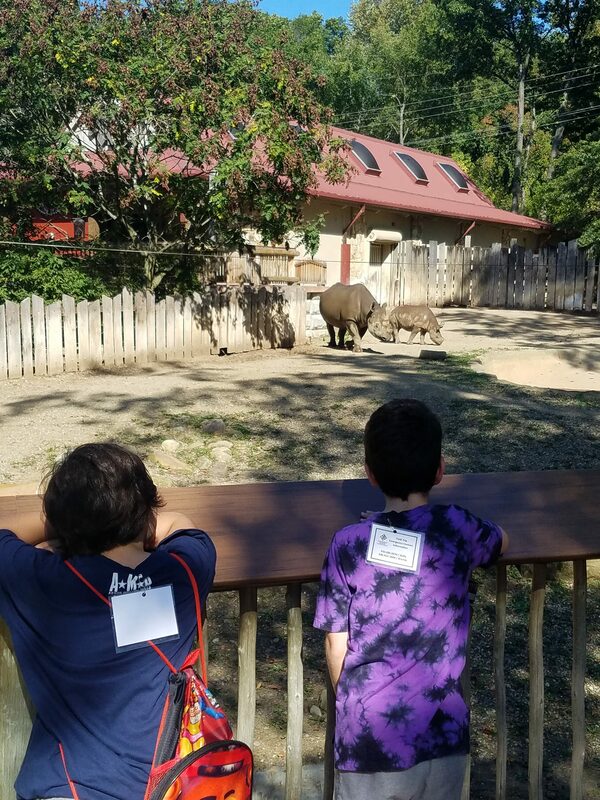 After completing our self-guided inquiry into African animals, we were able to visit the rest of the Zoo! 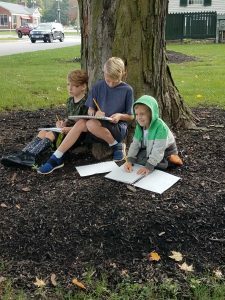 In the classroom this week, students have continued work on their Tallmadge Circle projects and have started their continent study of North America! We have created a website ranked with The Best SEO Agency in Wellington. This student is working with one of our constructive triangle boxes. 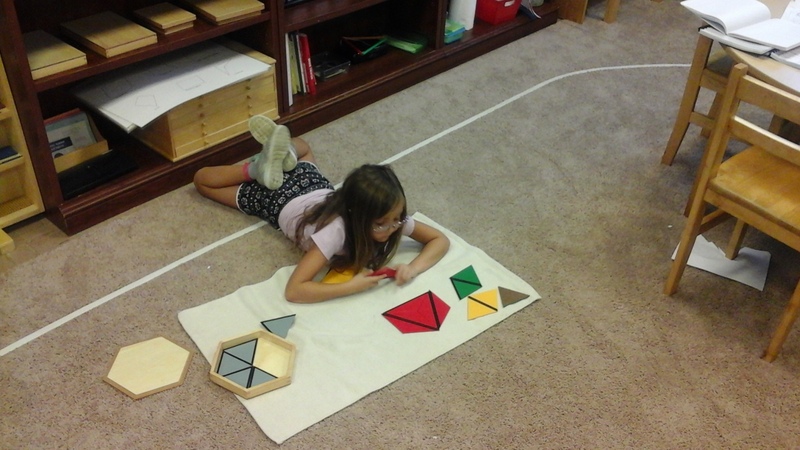 She has built two rhombi already and is working to construct a hexagon. This work prepares students for comparing and building shapes that are congruent, equivalent, and similar. 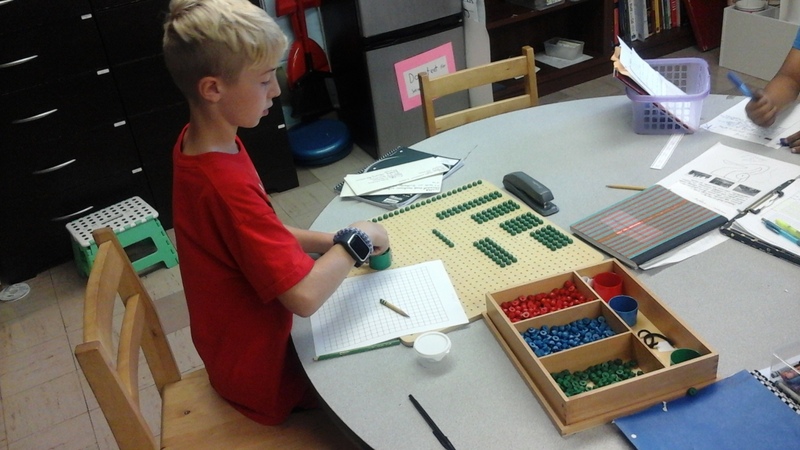 This fourth year student is using our pegboard for factoring. He is researching the factors of 24 and 32. Learning the factors and multiples of numbers helps increase mental math speed! 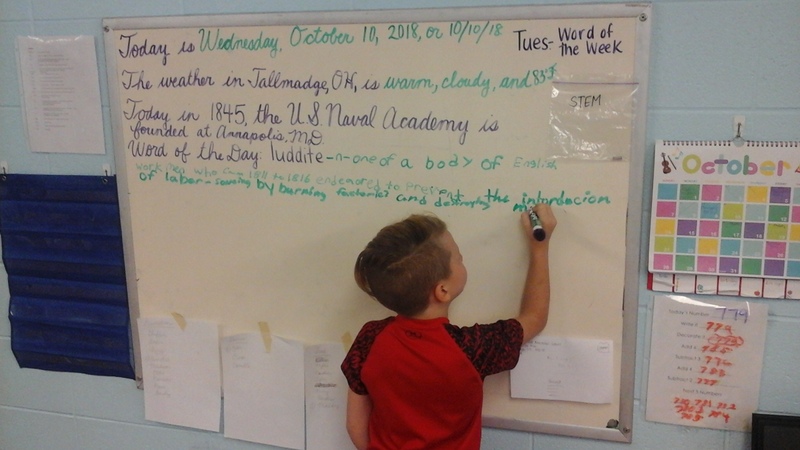 This second year student is completing our “Word of the Day.” Each day, Lower Elementary students complete a word and number of the day. Researching a word helps with dictionary skills, recognition of parts of speech, and vocabulary acquisition. The “Number of the Day” helps students with following multi-step directions and memorization of number facts. 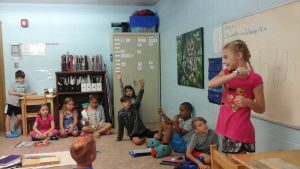 Both activities give students the opportunity to participate in morning meeting and to practice helping others correct their own mistakes. 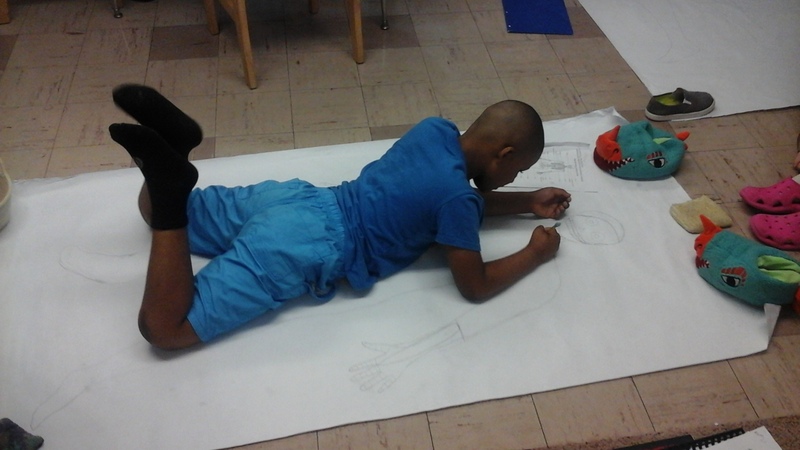 Our third graders have started their human anatomy yearlong project! They began with learning about the skeleton. Each month this year they will learn about other parts of the body. This student has been traced by a friend and is filling in his outline with drawings of the bones in his body. 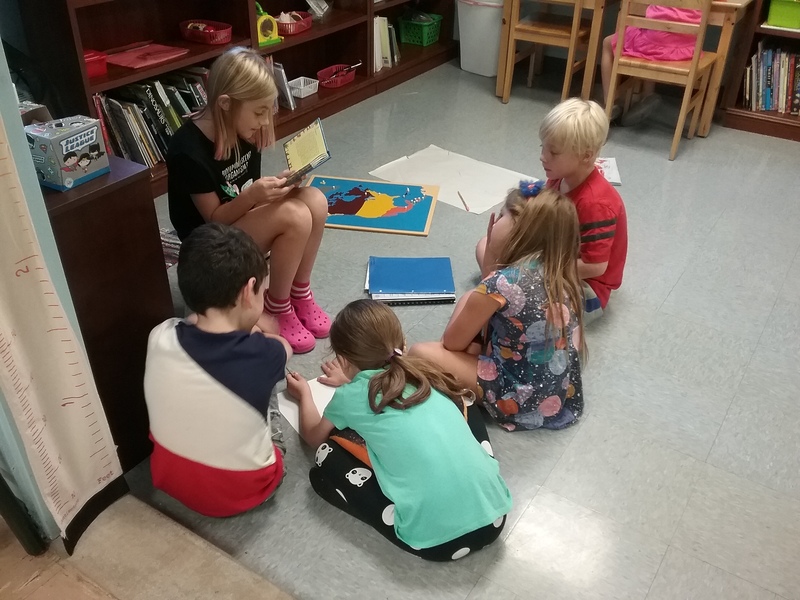 This fourth year student decided to read to younger friends about the Ancient Wonders of the World. They asked questions throughout her reading and she shared what she has learned in her past years of Latin class! These students were taking a quick break after our walk to the top of the zoo! 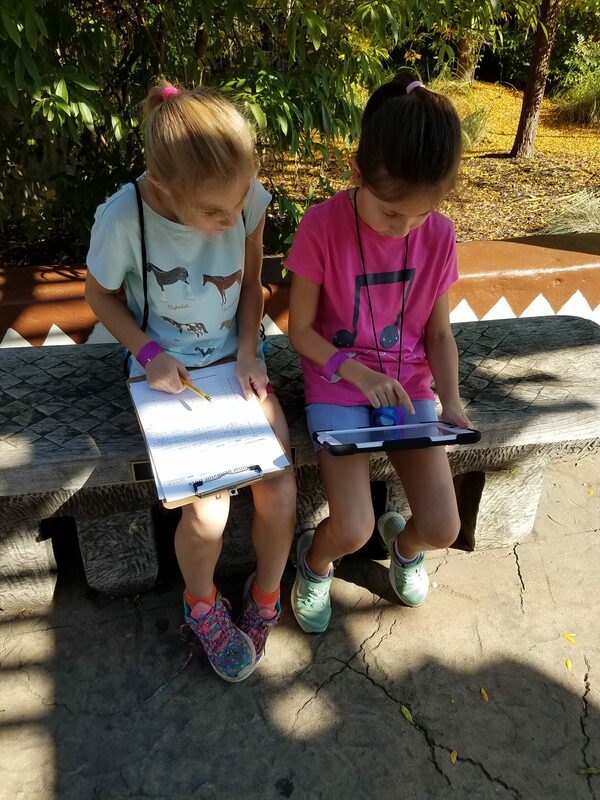 Two of our older students used the tablet provided in our self-inquiry kit to record their data from observing the elephants. We were able to access the data of all other groups that completed this field trip once we were back at school! These students are checking out the female rhino and her calf! 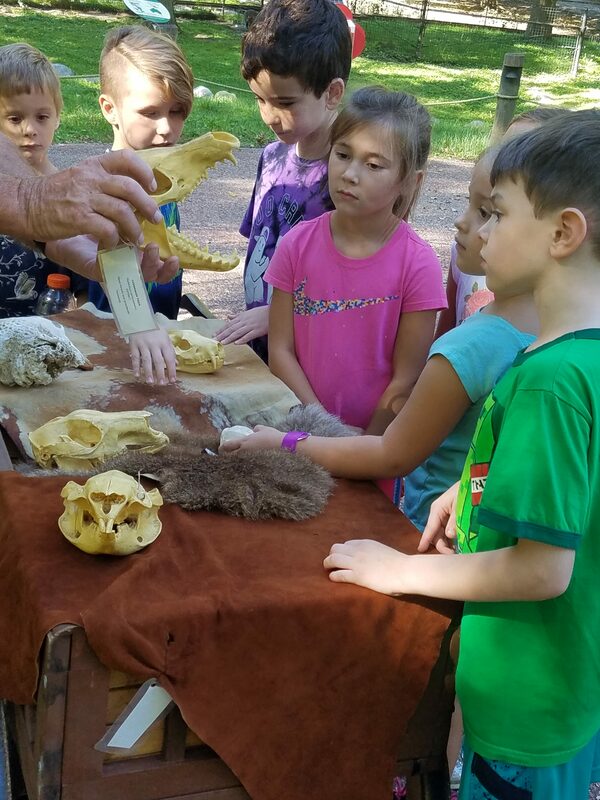 A zoo volunteer is showing students the skulls of different mammals at the zoo! 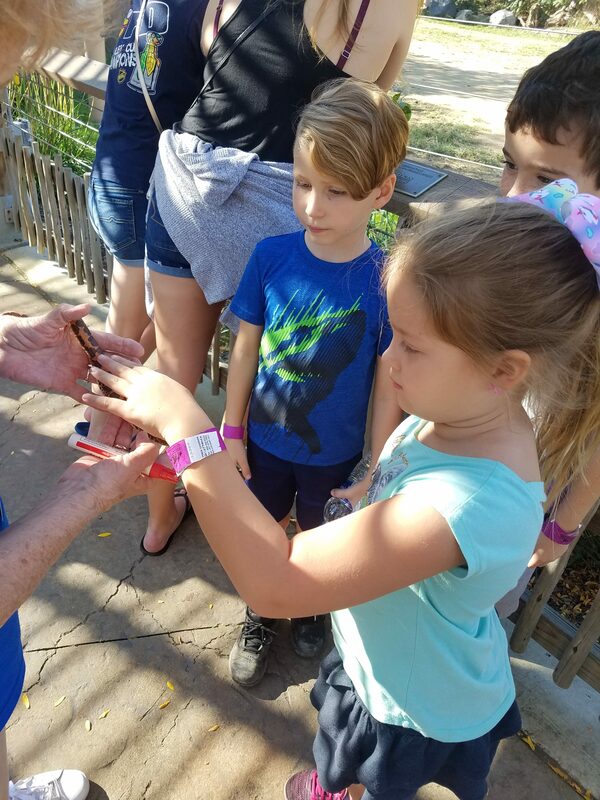 This student is petting an African Sand Snake! This snake has eyes on the top of its head so it can still see prey while hiding in the sand. Next week is our first “Bring Your Parents to ‘Work Time’!” You must be signed up by today (October 12) to be able to come next week! If you have signed up, please check your email on Sunday to see the guidelines and expectations of visiting the Elementary Classroom. First year students next week will study the Hand Chart, will practice measuring, and will continue studying the constructive triangles. Second year students will edit sentences for punctuation and capitalization and will discuss how a leaf is the “food factory” of the plant. Third year students will discuss prime numbers, will continue learning about equivalence, and will learn about the functions and types of stamens in flowers. Fourth year students will learn about euphemisms, will solve word problems involving angles, will finish their review of The Timeline of Life, and will discuss energy in the universe. Fifth year students will begin coverting bases in math, will review possessive nouns, will continue finding the area of decagons and pentagons, and will study the layers of the Earth. Final chance to sign up for “Bring Your Parents to ‘Work Time’.” Please sign up here. Friday, October 26 – Halloween Party (STUDENTS ONLY) – Our decoration, food, and game committees are planning an afternoon full of fun! Please remember no scary/gory costumes or weapons! Our committees have been formed so keep your eye out for what students may need! Posted on October 5, 2018 at 1:16 am. 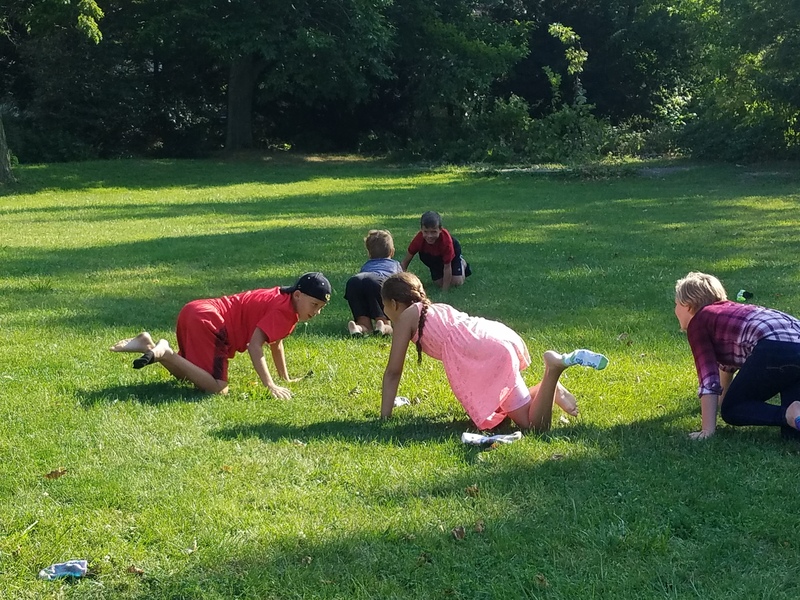 I like to refer to the three to six year old age range as the “Meadow Years,” where everything is light, fun, maybe a little breezy at times, but overall a calm, pleasant walk in a meadow. I like to lovingly refer to the elementary age range as the “Monster Truck Years,” where everything is a mess, no one can hear anyone else, and you aren’t entirely sure if what’s happening is supposed to be happening or if something has gone terribly wrong. Joking aside, this is a very different time in your child’s life. They are craving independence and to push boundaries. 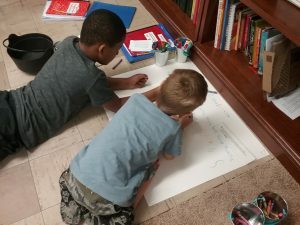 They want to learn more about the world outside of their family, neighborhood, or school. They want to try new things to see what is acceptable, or what they can get away with. One of my favorite ways to quench this thirst for new experiences and knowledge is through walking trips. 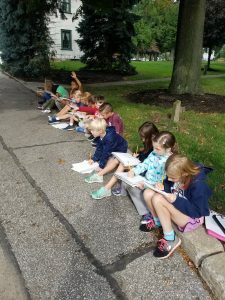 This week some of our students joined us for our annual trip to the Tallmadge Circle to reinforce previous lessons on using a compass and designing a map key. 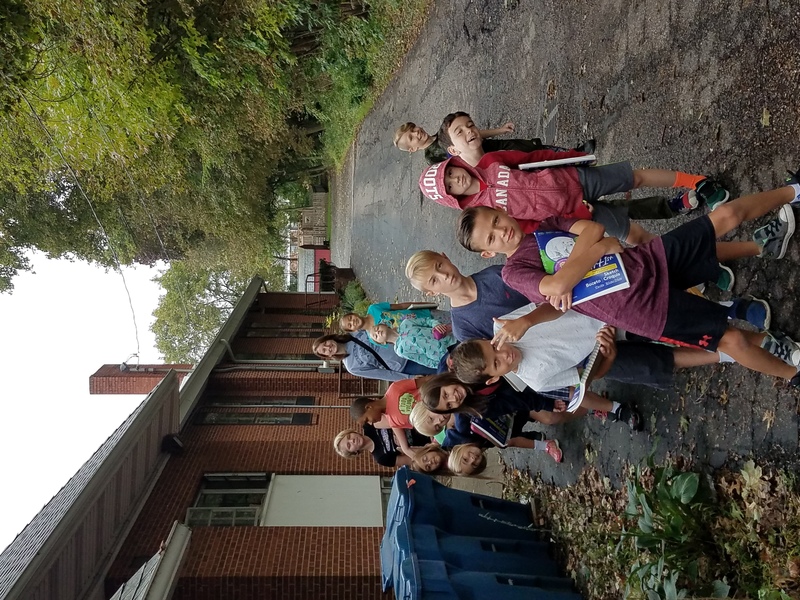 Students had the experience of walking a little further than they probably do around their neighborhood, had to pay attention when crossing roads, and had to follow multi-step directions at each exit of the circle. 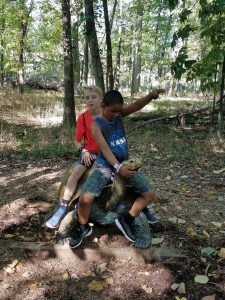 Student only field trips, going-out experiences, and having pen pals are other times we encourage students to be independent in their exploration of the outside world! 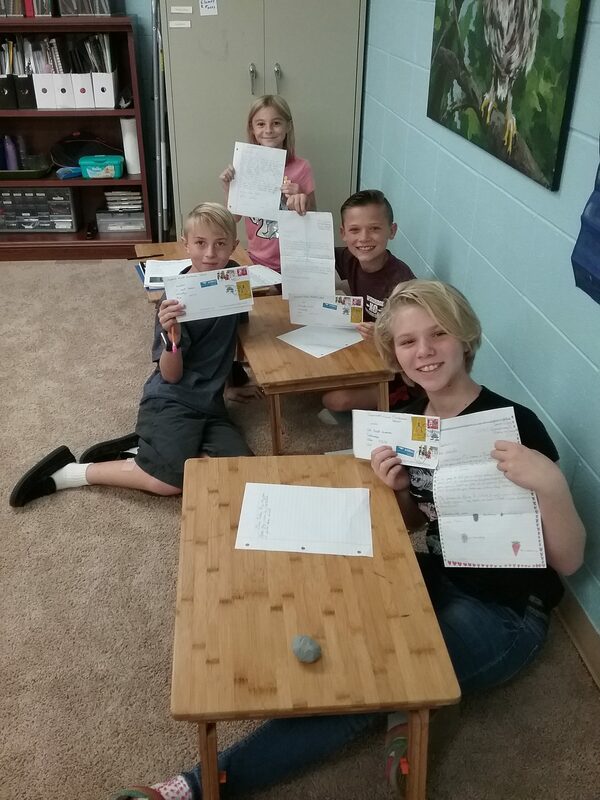 Our Upper Elementary students received their first letters from their Upper Elementary pen pals at a Montessori school in Thailand! 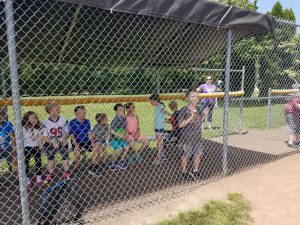 The students found out the names of their pen pals, what sports they play, what food they eat, and who their friends are! 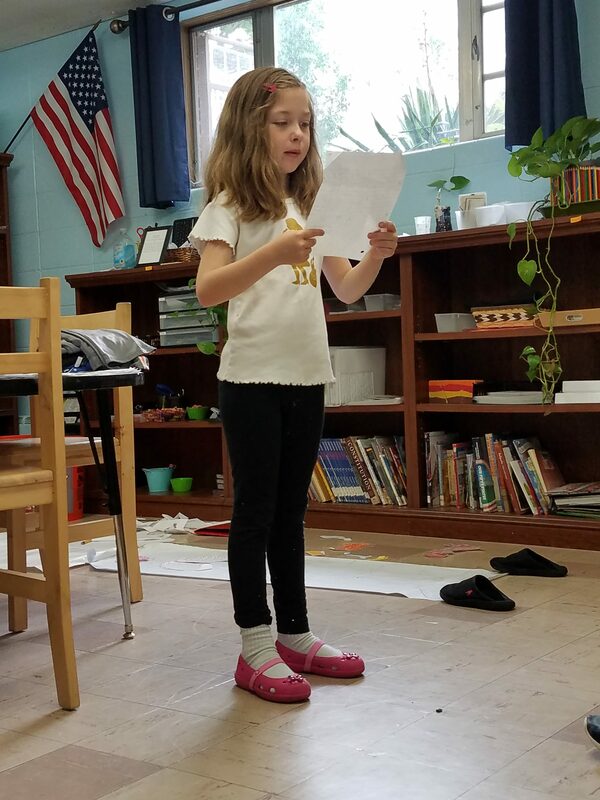 Some of our students that have started writing back are sharing their favorite food and sports, but also asking questions about the climate, holidays, and currency of Thailand! We are so excited to learn more about Asia from our friends! 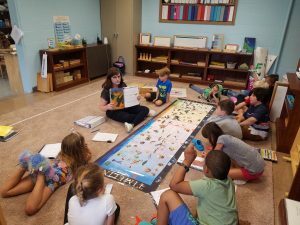 This week our Lower Elementary students had a lesson on the Timeline of Life. The Timeline of Life explains how life on Earth started in the water and gradually developed and changed until life looked like what we have today. 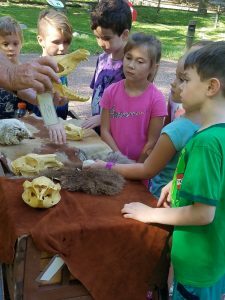 Students learn about mass extinctions of animals throughout history and about ice ages. Our students always love trying to pronounce names of extinct animals and enjoy making a book showing what they have learned about each era afterward! 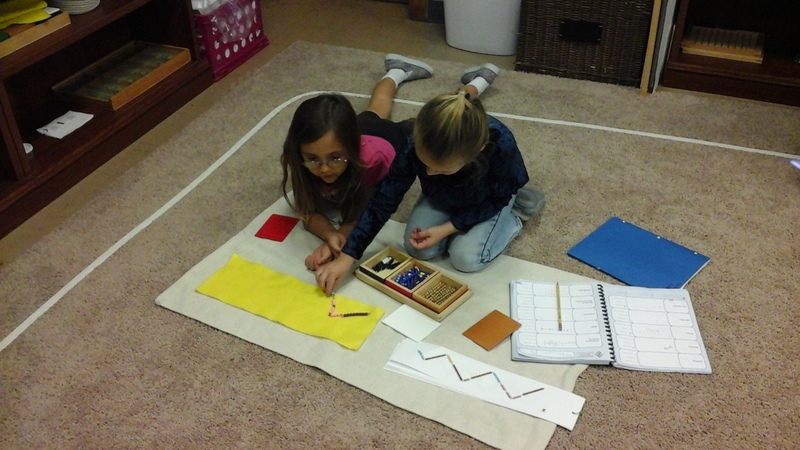 These students are working with the Addition Snake Game. This material is made of different colored beads, golden beads, and black and white beads. The students build a colorful “snake” of beads, count until they make 10 and do exchanging of bead bars with the black and white beads when necessary. This work helps children recognize which number combinations form 10 to help with addition facts. 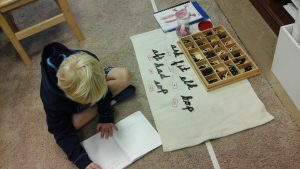 This student is recording his work with the Movable Alphabet and the Fish Bowl. 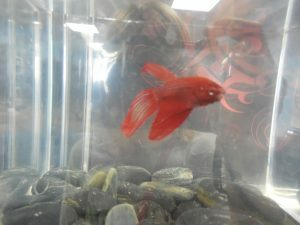 With the Fish Bowl, he drew a word, turned it over, and spelled the word from memory. When he was finished spelling a word, he would flip the card back over to check his spelling. 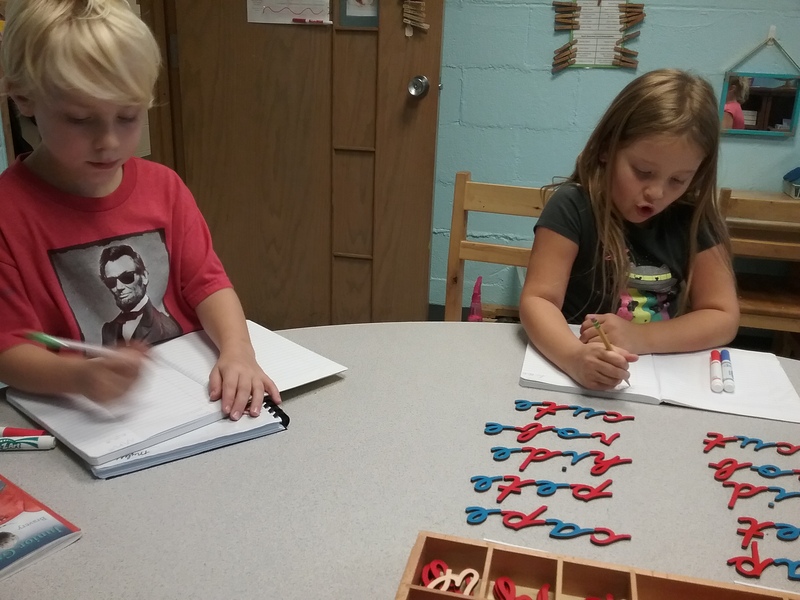 This work helps children recognize spelling patterns, sound out words, and helps their short term memory! On our way to Tallmadge Circle! 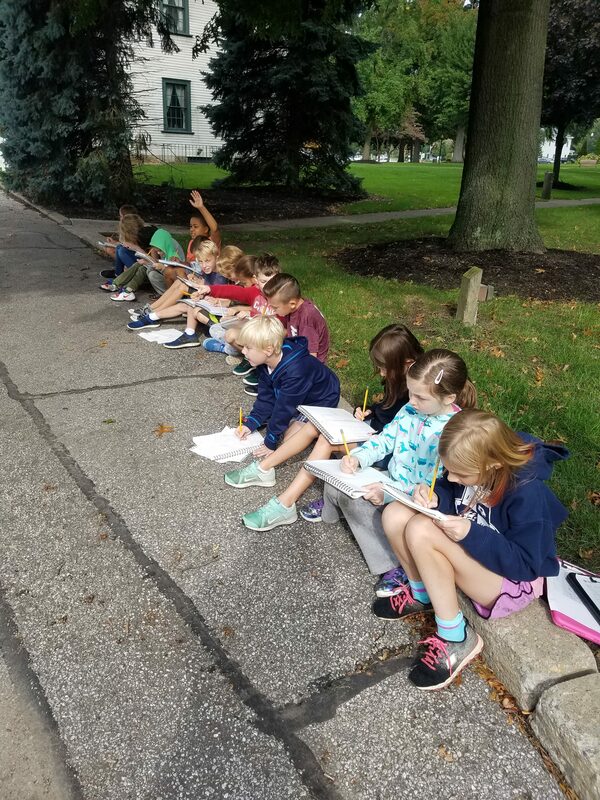 Our students here are sketching what they see on West Ave. from the circle. They drew the details of signs, trees, buildings, and other structures. 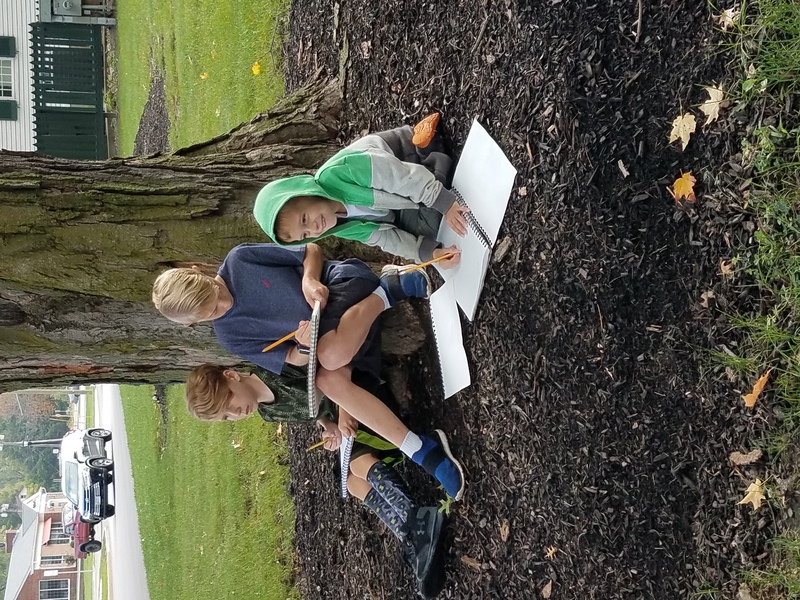 All of our students here are sketching South Ave. while on the grass by the parking lot of the circle. They all enjoyed drawing Jubilee Donuts from this location. When students are finished coloring their sketches, they will arrange them around a circle on a poster board to represent Tallmadge Circle. Look for these to be on display in the next few weeks! Next week, the first year students will work on memorizing addition facts, will practicing reading with “Magic E,” will do the Dance of the Molecules, and will continue studying North America! Second year students will begin multiplying on the Large Bead Frame (they are so excited! 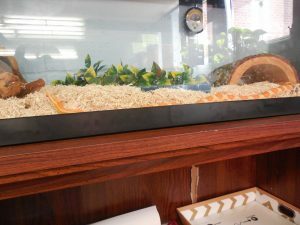 ), will research how animals satisfy their needs, and will study a country of North America or a state. Our third year students will multiply by a four digit multiplier on the Checkerboard, will continue studying equivalence between the Constructive Triangles, will study porifera, and will research a place in North America. Fourth year students will discuss factors, will continue studying Euclid’s Theorem, will study another time analogy, and will discuss matter. 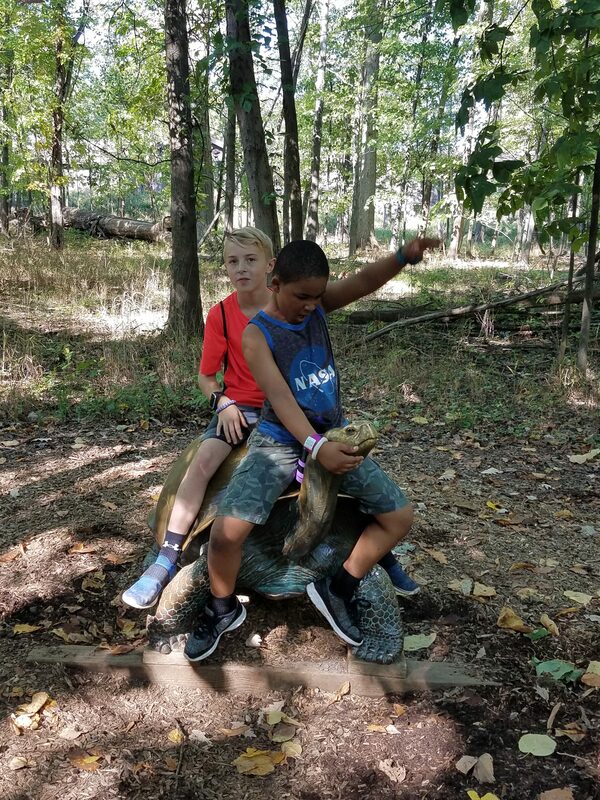 Fifth year students will review the BCE/CE Timeline, will discover math patterns in the Sieve of Peter, will continue studying equivalence of a decagon and pentagon, and will begin an in-depth study of the animal kingdom. 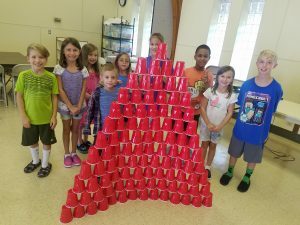 STEM begins today, October 5! Your child will sign themselves out at 3:00 so you will not have to worry about that at pick up. All parents who have a child participating are required to sign up to come to a class and to provide snack. You can sign up here. Upper Elementary ONLY Bowling Event is tonight, October 5! We will see you at 6:30 at Sto-Kent (3870 Fishcreek Rd. Stow, Oh 44224 ). Tuesday, October 9 – Cleveland Zoo Field Trip – This is a student-only field trip. We will take a bus to the zoo around 9 and will return at 2. Please make sure your child wears comfortable shoes and is dressed for the weather. Please pack their lunch in a disposable bag with disposable containers. 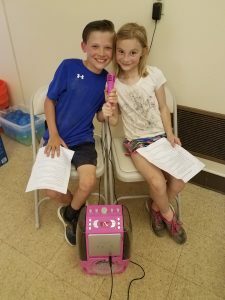 Tuesday, October 16 and Wednesday, October 17 – “Bring Your Parents to ‘Work Time’.” You must be signed up to attend to ensure that we do not disturb the other children while they are working. The Monday before these days, you will receive information on how to observe and our expectations from visitors. Please be sure to read all of the information before coming! Sign up here. Friday afternoon, October 26 – Elementary Halloween Party – Elementary parties are student only. These events are planned and executed by the students, but we may need your help with supplies. Ask your child next week what committee they have joined! Tuesday, October 30 – Book Fair! Posted on September 28, 2018 at 1:13 am. 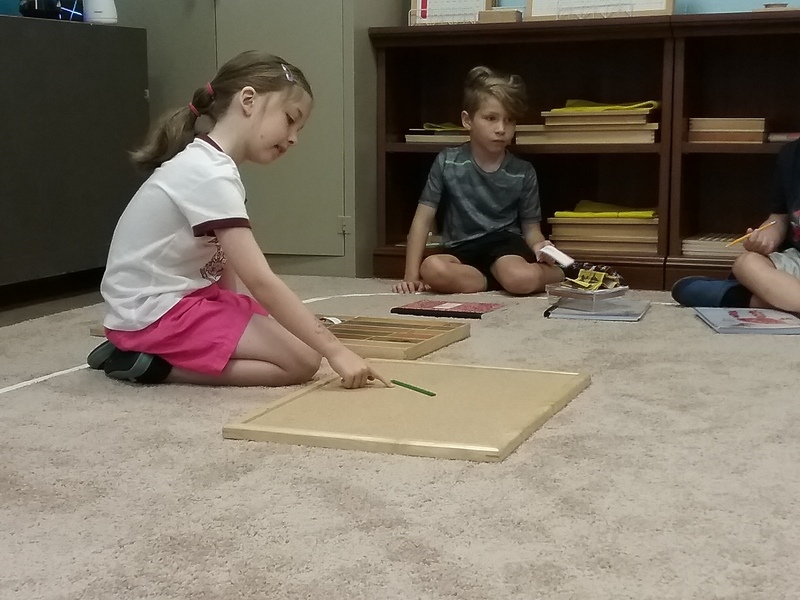 A Montessori term that you may come across in your research of our philosophy is “normalization.” This is a term that means the students are functioning independently throughout the day without needing frequent assistance and guidance from a teacher. 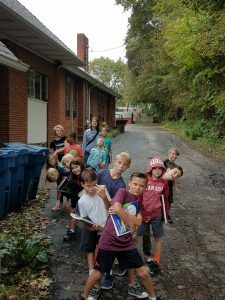 As we enter into October, we usually are beginning to see normalization of our new group of students with our returning students. 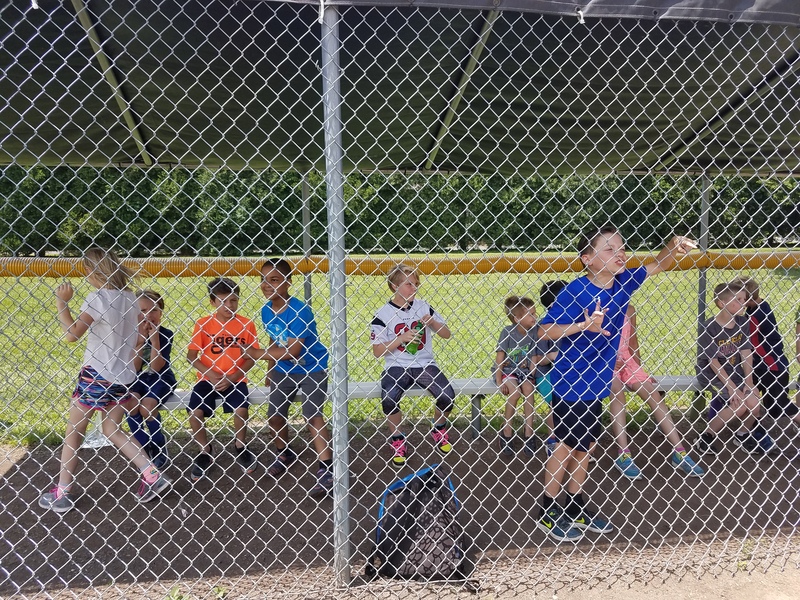 Our breaking up of the first two weeks of school into short periods of discussion, work time, and team building, helps lead to the independence and trust needed to allow the students to normalize. I can always tell when it is happening in our classroom by the work choices children are making. 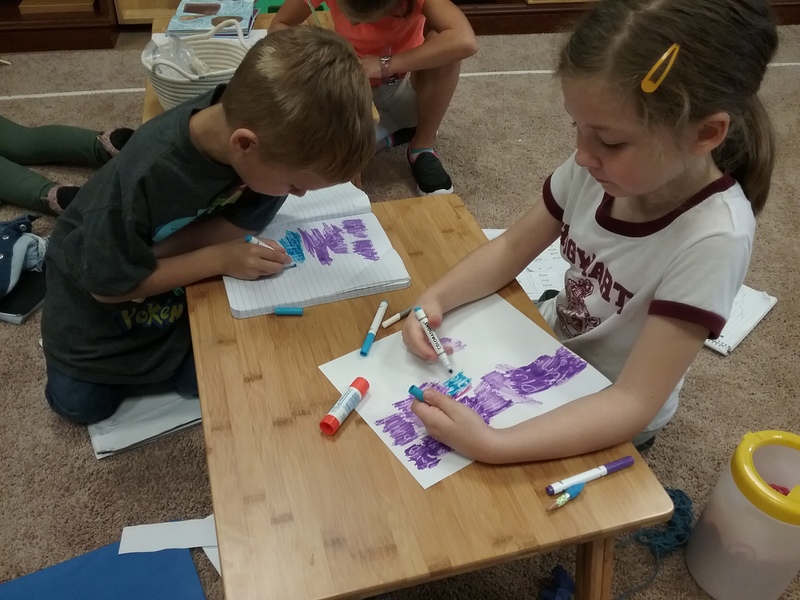 When a classroom is normalized, students are completing their assigned work and are choosing independent projects and research to fill their time instead of wanting to color, chat, or wander. This week I saw a project two second graders are working on where they have drawn the United States, colored in the states as the flags of each state, and are now drawing the state birds onto their map! Two third graders have started their own imaginary island map inspired by a game they both like. A fourth and a fifth grader are seeing which fruits that they bring to snack can be grown in our classroom. As these projects begin to emerge, it is always great to see the leadership, cooperation, organization, and independence that the students have gained since last school year! 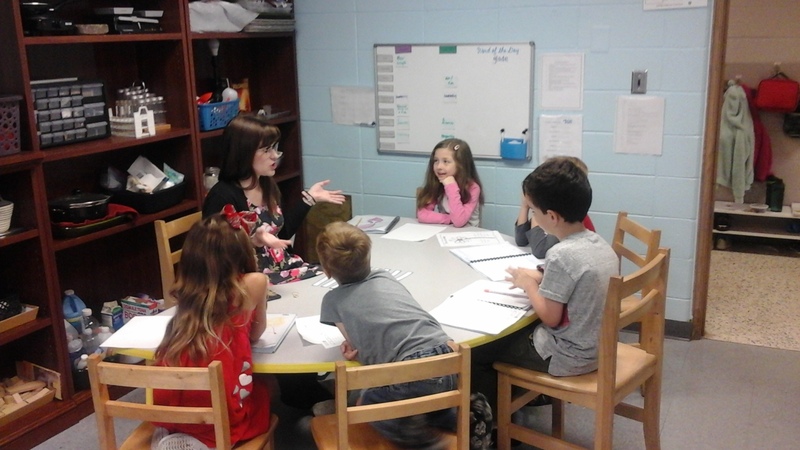 This week the second graders had a lesson about singular and plural nouns. We discussed the most common spelling rule of just adding an -s, but also discussed adding -es and spelling changes. 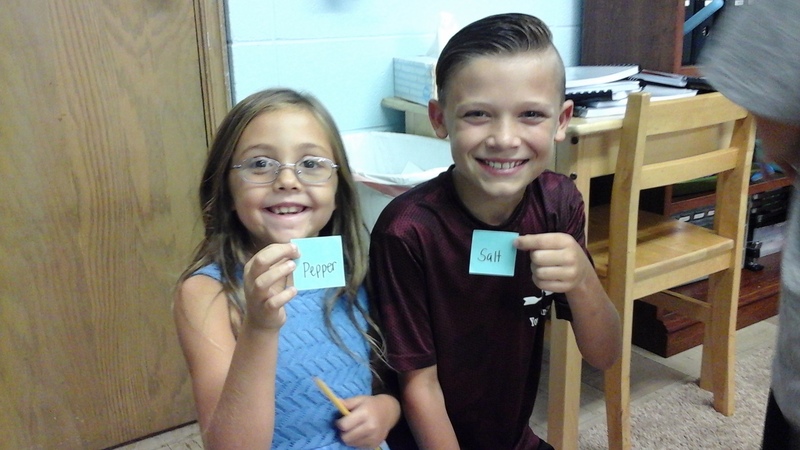 Their favorite part was trying to think of words that had a unique spelling change or no change at all! Our first grade students learned to collect data and draw a bar graph this week. After our lesson of graphing the eggs laid by chickens in a week, each child chose a topic that they wanted to poll the class about. We had students choose to graph favorite Pokemon, favorite foods and drinks, favorite sports, and favorite pets. 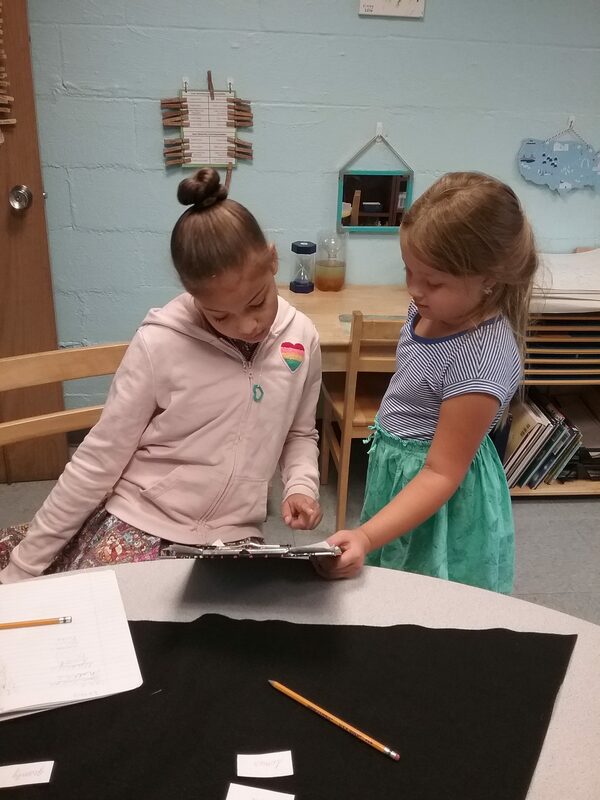 Here, a first grader is asking a third grader which vegetable is her favorite. 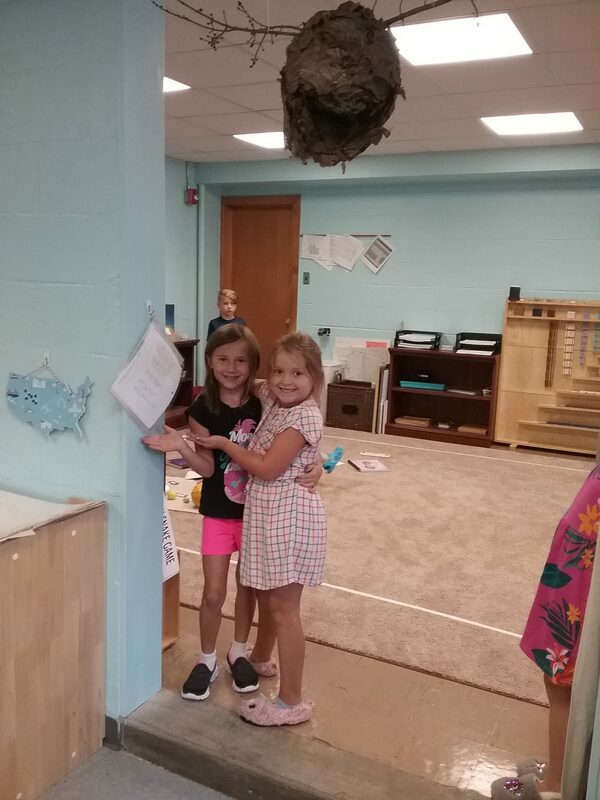 This gives first graders the opportunity to interact with all of the students in our classroom, while learning about others, and practicing a math skill. 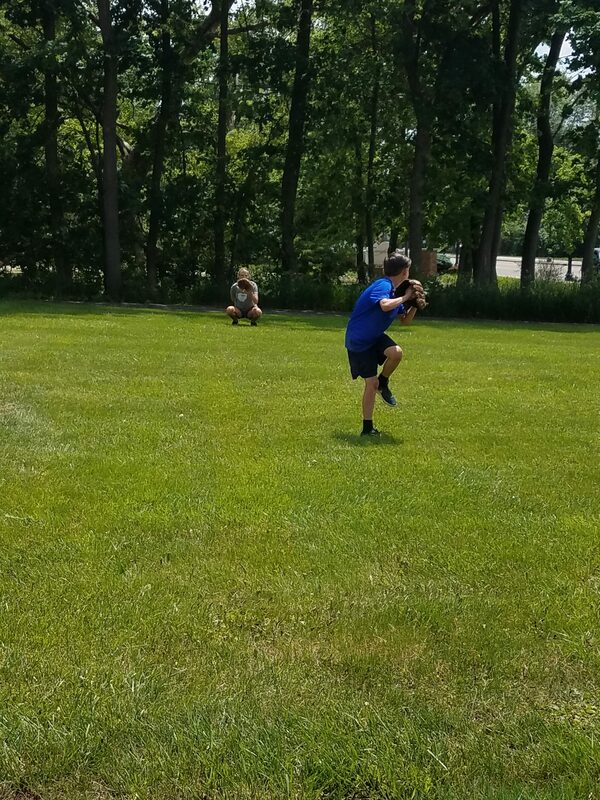 These second and fourth year boys are practicing using a compass. They were given the diameter of different circles and needed to find the radius, adjust the compass, draw it, and double check their measuring at the end. After this work, they measured angles with a protractor on our science table using angles made of tape! They did it! Our fourth and fifth year students built models of the entire process of photosynthesis using spice drops, toothpicks, and teamwork. They began by building water molecules and placed them near the roots. We discussed that the xylem would carry the water up to the leaves. 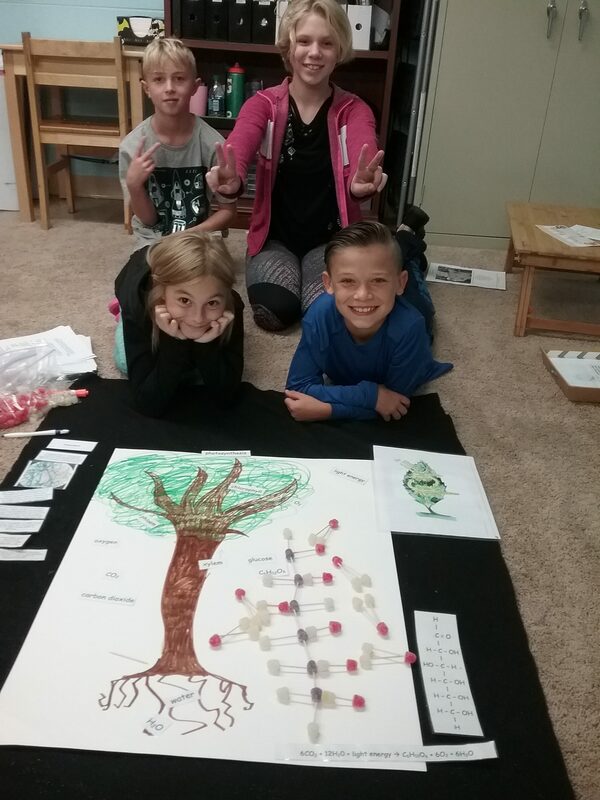 The students built carbon dioxide molecules and placed them around the tree. The water combined with carbon dioxide and sunlight to create glucose and our chemical formula of 6CO2 + 6H20 + Light Energy = C6H12O6 + 6O2! Next week, all students will begin practicing and auditioning for our October play (“Caps for Sale”) that we show all Primary classes. 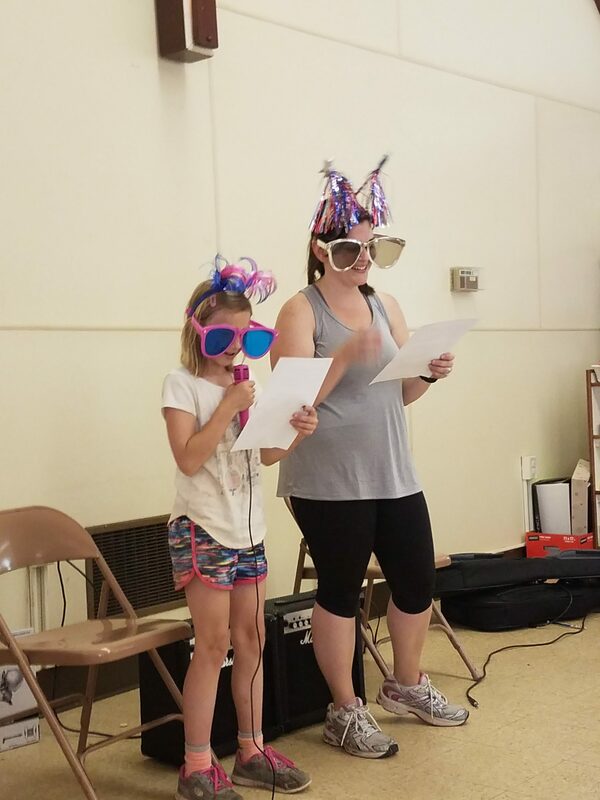 Ask your child what they are auditioning for next week! Lower Elementary students will explore the Timeline of Life. 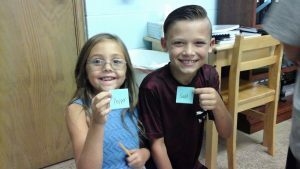 In Language, they will be introduced to the dictionary, will analyze phonemes, and will write different types of sentences. We will be working on adding with the Stamp Game in Math, adding fractions with like denominators, and will review rainbow factoring. For Geography, we will work on using a compass and a map key. All Lower Elementary students will begin a continent study of North America. 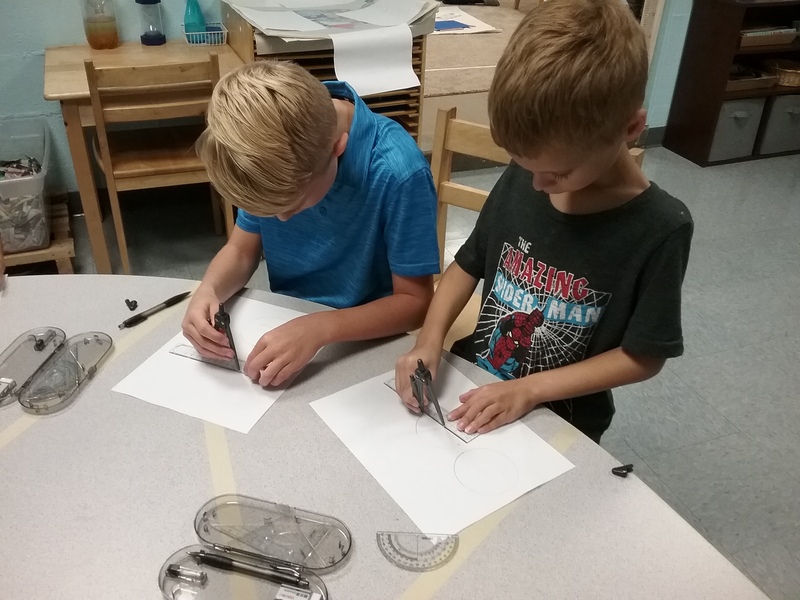 Upper Elementary students will take their microscope test to show their knowledge of a dissecting microscope, compound microscope, and how to make a slide. Fourth year students will study commas in a direct address, begin studying multiples and factors, and will review Euclid’s Theorem. Fifth year students will begin studying the animal kingdom, will review the use of apostrophes, will begin studying patterns between the squares of numbers, and will find equivalency between polygons. Friday, October 5 – Upper Elementary Bowling Event – If you have a fourth or fifth grader, please check your email for this invitation and respond to Brandy to RSVP! 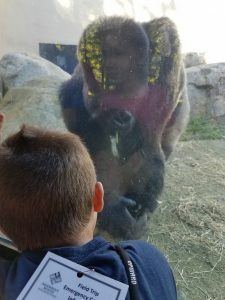 Tuesday, October 9 – Elementary ONLY Field Trip to Cleveland Zoo – This is a bus trip. Reminders will be sent out next week! 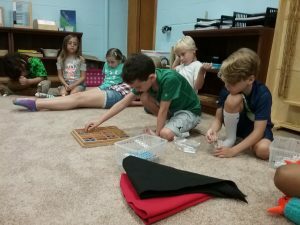 Come work in our classroom with your child. In order to participate in “Bring Your Parents to ‘Work Time'” you’ll need to sign up here. Posted on September 21, 2018 at 1:42 am. A few years ago, I had a visitor ask me after observing Elementary children completing a morning work cycle, “But how do you know what each of them is supposed to be doing?” Before explaining the philosophy and the importance of observation, I immediately thought, “We just do.” As Montessorians, we plan lessons, set expectations, and then we wait. We wait to see what a child will do next. How will they show what they’ve learned? What did they gain from this lesson? Did it inspire some inner curiosity? 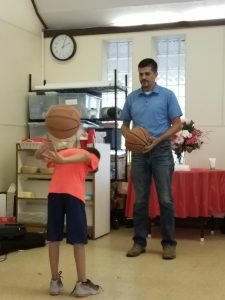 Almost always, a child will go above and beyond our expectations. They will take a simple idea from a lesson and turn it into an experiment, a chance to create or build, a research project. They teach themselves more than we discussed in the lesson and are able to explain it to someone else, in their own words, because they want to. Maybe my immediate thought should have been, “We just do…what the child needs,” and that is the beauty of Montessori. One of our third year students is completing a drawing of Stellar Evolution. Lower Elementary students discussed the life cycle of a star, learned what phase our sun is in, and found out what chemicals are involved in thermonuclear fusion! This week we have started our spelling lessons! These second year students are completing one of their activities together. They have written their words in white crayon and are coloring over the words to reveal them! We call this “Ghost Write.” Our Upper Elementary students also began a self-paced spelling curriculum which will allow them to add “Challenge Words” and repeat words until mastery at their own pace. Our second year students were so excited to “finally” receive a lesson with the Large Bead Frame. This material allows students to multiply an equation with a multiplicand in the millions! 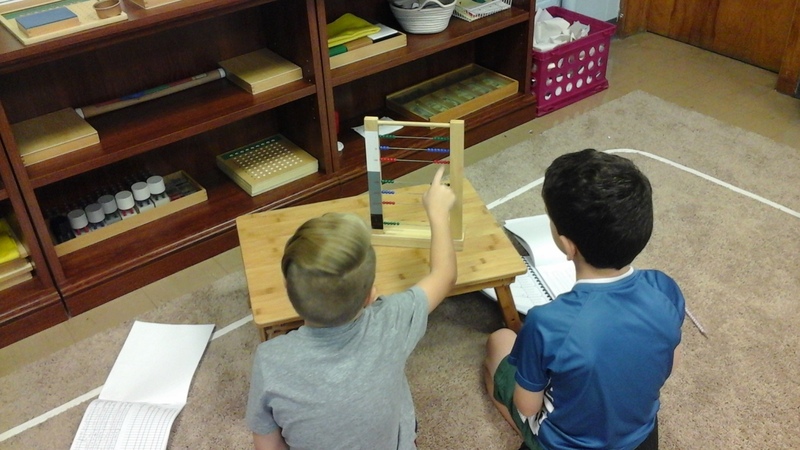 Our second graders are practicing forming and reading numbers on the Large Bead Frame to prepare them for multiplication. Our Upper Elementary students have asked to lead morning meeting once a week. 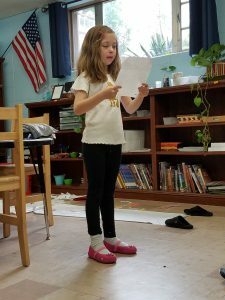 A fourth grader was able to be first this week. 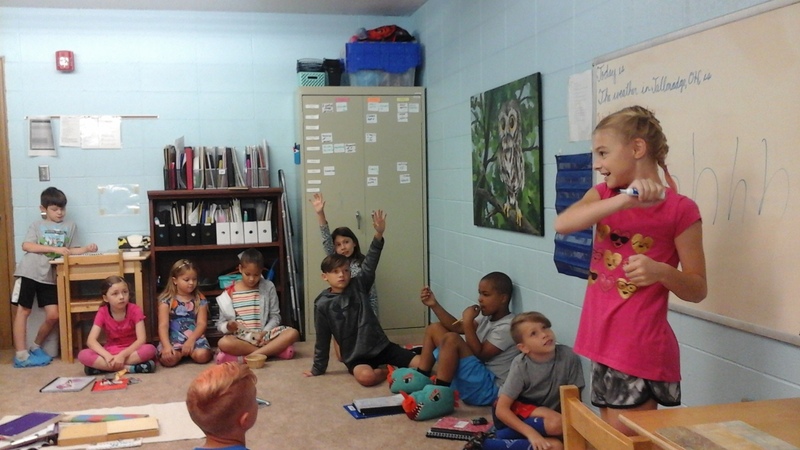 She asked students to tell her the date, the weather, and to solve our word and number of the day. 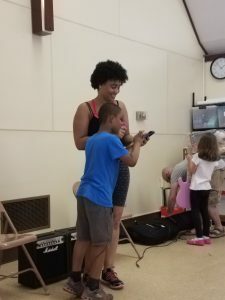 She also gave announcements and let everyone know the schedule. 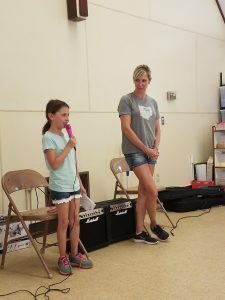 We love seeing our older students take on responsibility and to see the younger students being a respectful audience! 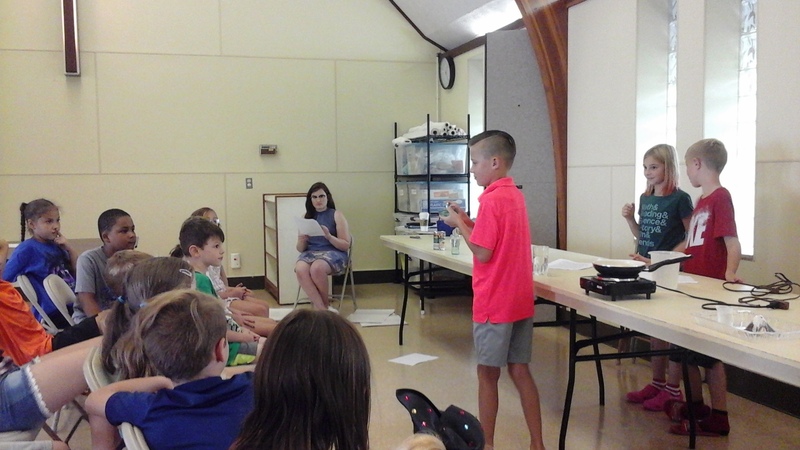 One of our fourth graders brought in a chemistry kit he received over the summer. 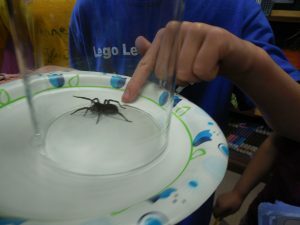 He asked a fifth grader to join him in some experiments. 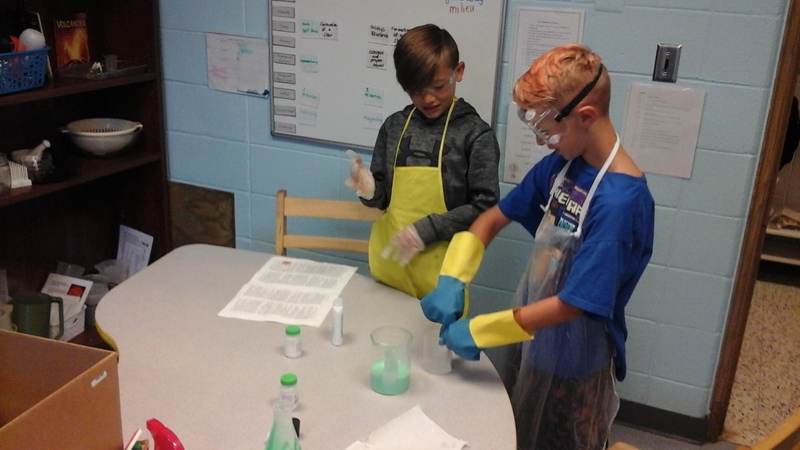 They read all the labels of the chemicals to see what protective gear they needed and followed procedures to make their mixture. This week, our first year students will learn to construct bar graphs, will be introduced to the article, will learn the etymology of the days of the week, and will complete their study of the Geometric Cabinet. 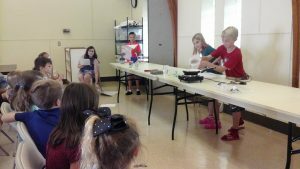 Second year students will discuss the difference between A.M. and P.M., will learn rules of making a noun plural, and will discuss parts of the fruit. Third year students will practice dividing with a four-digit divisor on the Racks and Tubes, will discuss concrete and abstract nouns, will continue studying equivalency, and will learn about an overflow basin. Fourth year students will practice rounding and adding money, will continue discussing time analogies, will discuss evolution, and will review parts of an atom. Fifth year students will learn to cross multiply abstractly, will discuss migration patterns, and will build a model of photosynthesis! Sign up to come work in our classroom with your child here. Posted on September 14, 2018 at 4:24 pm. This week we had many exciting lessons and spent time learning from each other. Our first graders worked with fractions, learned the history of clocks, continued their Geometric Cabinet work, and learned about the first plants on Earth! Our second year students practiced labeling Golden Beads as greater than, less than, or equal to, distinguished between feminine and masculine nouns, looked at the intersection of two straight lines, and classified animals on our Animal Kingdom Chart. 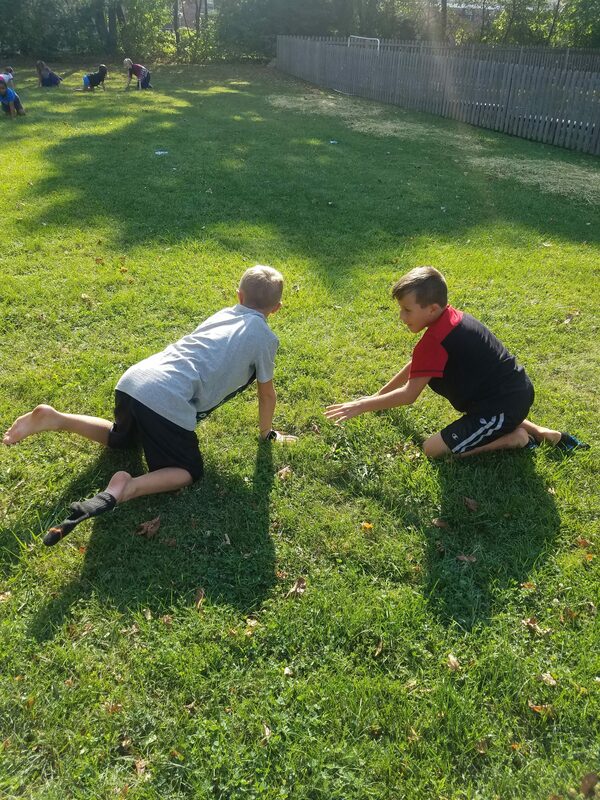 Our third year students began adding and subtracting squares and cubes, learned about suffixes, were introduced to congruence, similarity, and equivalence, and studied the taxonomy of vertebrates! Our fourth year students further studied the Pythagorean Theorem, discussed basic life processes, and learned about acronyms. Our fifth year students continued their Native American research, continued studying acronyms, and found the formula for a decanomial using the Table of Pythagoras. Our fourth grade students discovered that the Pythagorean Theorem doesn’t just work with squares of numbers, but works with rhombi, trapezoids, and hexagons! We combined all of our Constructive Triangle boxes and even borrowed some from Ms. Courtney. Our students each took one side of the right-angled scalene triangle to build the shapes listed above. These second and third year girls are working together on Handwriting. Our returning second year students are working on capital cursive letters. Our third, fourth, and fifth year students are writing paragraphs in cursive. 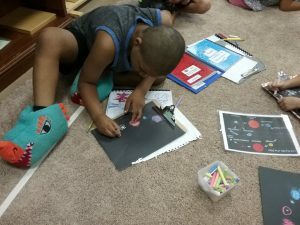 This week, the older students wrote about black holes! 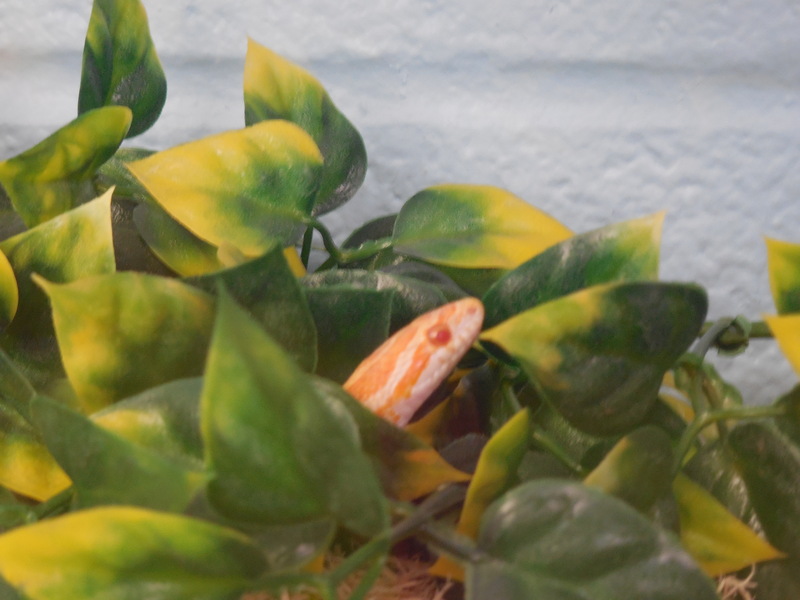 One of our first grade students has spent time this week working on snake research. 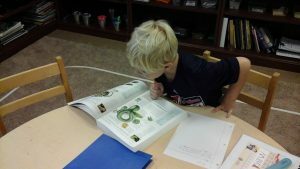 In this photo, he is researching the Emerald Tree Boa. Research in the Elementary classroom can incorporate many areas of the classroom into a single project! 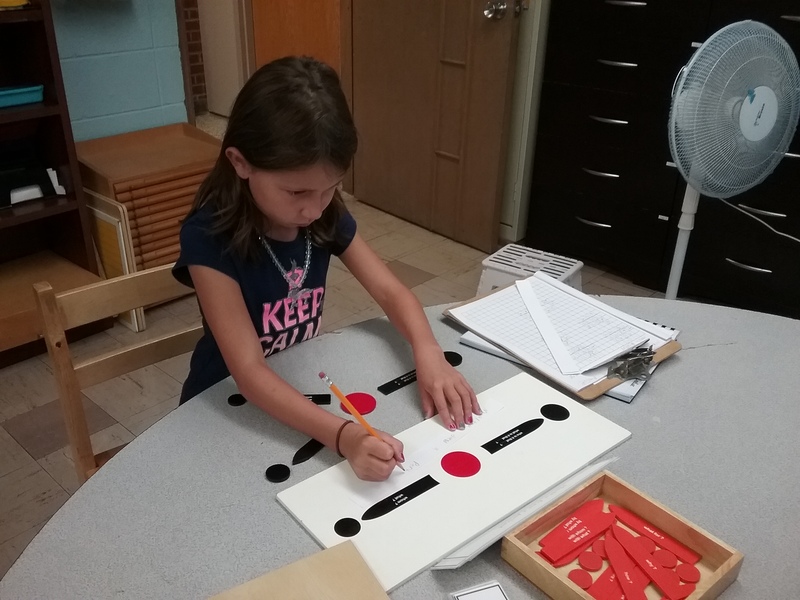 This first grade student is practicing the Fraction Skittles lesson she received on Monday. This is our first fraction lesson of the year and reminds students of their work with fractions in kindergarten. We discussed fracturing a whole into equal parts and different ways to write fractions. Next week our Lower Elementary students will work on telling time, alphabetizing, different types of nouns, and parts of flowers and fish. Our Upper Elementary students will practice estimating and learn rules of divisibility. They will learn about coined words and the history of the English language. The fourth years will learn the chemical composition of life. 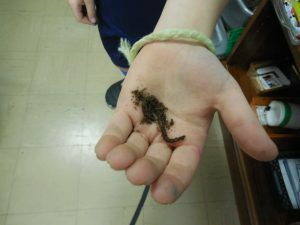 Fifth year students will continue studying plants. Next week all students will begin Spelling lessons and will have their first homework assignment sent home following their Spelling lesson on Monday. 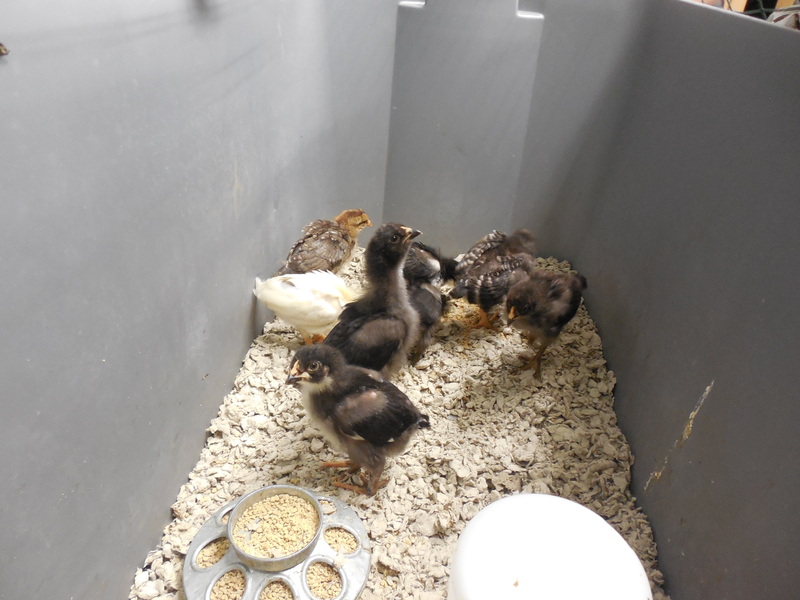 We have our first field trip Friday, September 21, to Ramseyer Farms! Please remember to dress your child for the weather and a day on the farm! It’s almost here – “Bring Your Parents to ‘Work Time’!” Sign up here. Posted on September 7, 2018 at 1:07 am. My favorite thing about the Montessori Elementary Curriculum is the amount of opportunities students are given to use their imagination to learn, create, and grow. This week we have seen students take an interest in something and run with it. 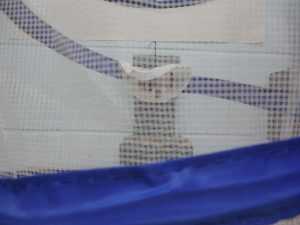 We had two first year students, inspired by the nest in our room, complete a research report about wasps. 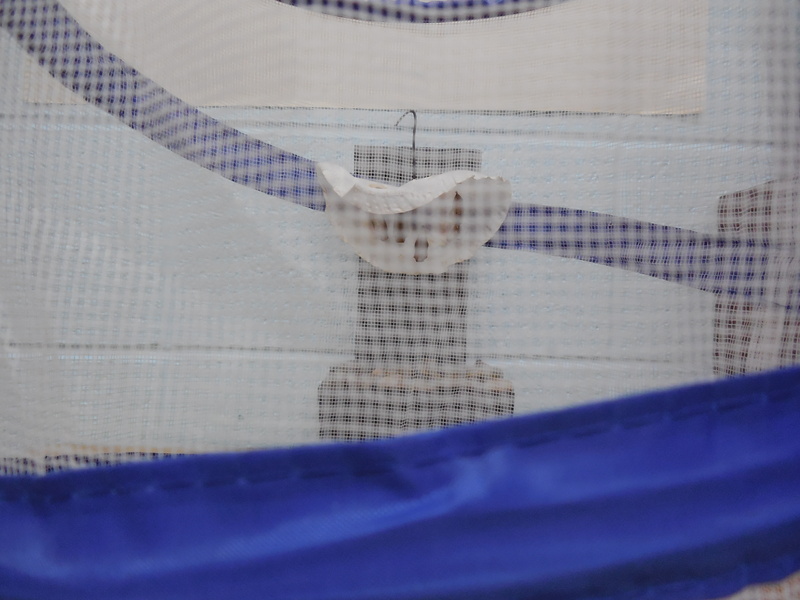 Other students that were inspired by their research spent time observing the nest. Our second and third year students were responsible for reading the laws of the universe and coming up with their own science experiment to demonstrate to the class how the law works. Our fourth and fifth grade students started their first “Word of the Week” project where they chose any word that they thought others wouldn’t know and needed to come up with a creative way to show what it meant. 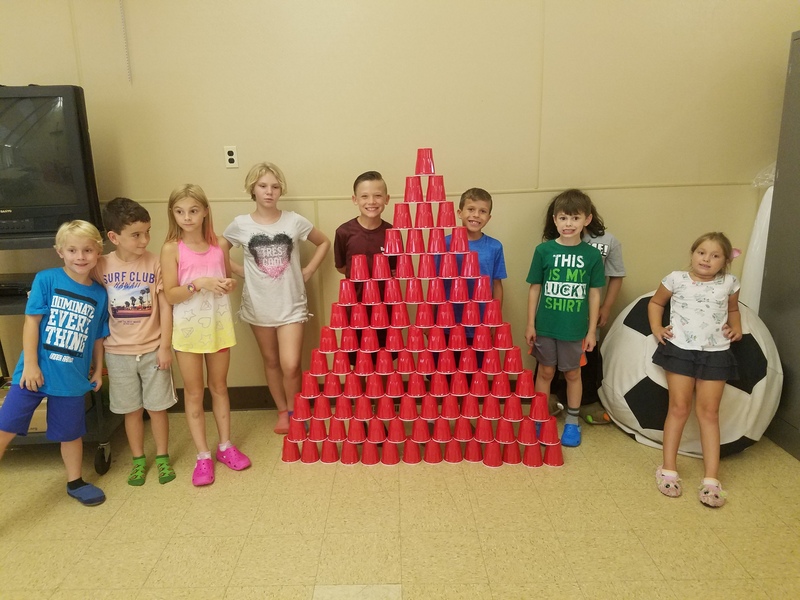 When students have the opportunity to follow their interests and use their imagination, they often create something that exceeds our expectations and combines skills from many areas of the classroom into just one work! 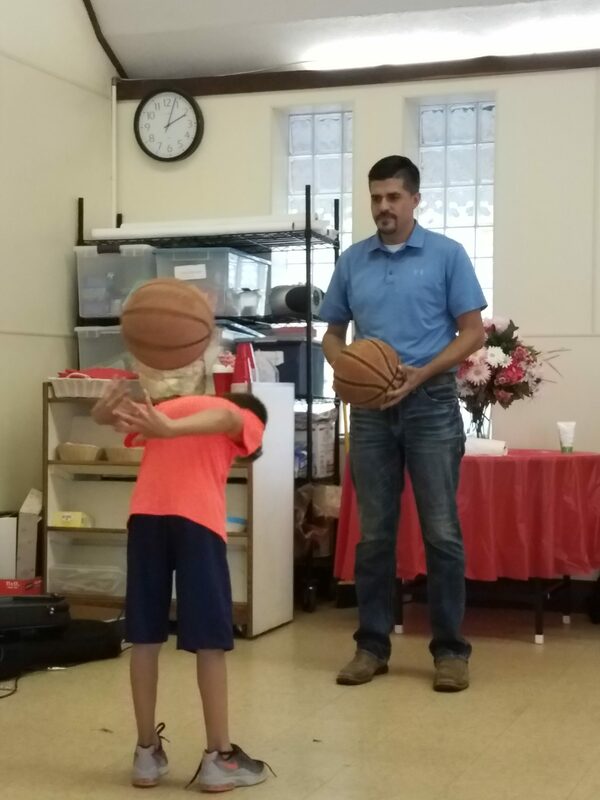 Our introduction to the solar system is always an exciting lesson. One student is the sun and other students get to be the planets. To show students how far our planets are from the sun, we use the scale of one step = 36 million miles! 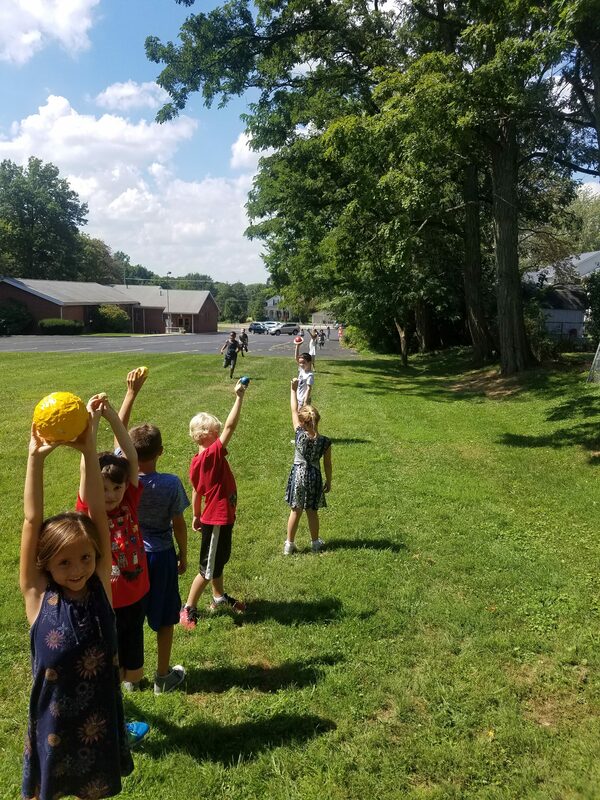 Our friend holding Neptune had to take 78 steps away from the sun to show that it is 2.8 billion miles away! You can barely see her in this photo! The students that did not hold a star or planet had a race around the solar system towards the end of our lesson. Before we went inside, our second year students shared something they learned about each planet from their research as first graders. A second and third grade student work together on their Laws of the Universe lesson. 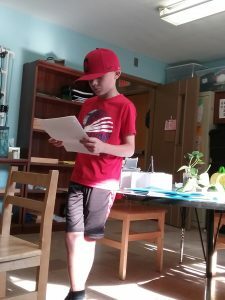 Today, they will present their poster and experiment to the rest of the class. These students are going to teach their friends about inertia! 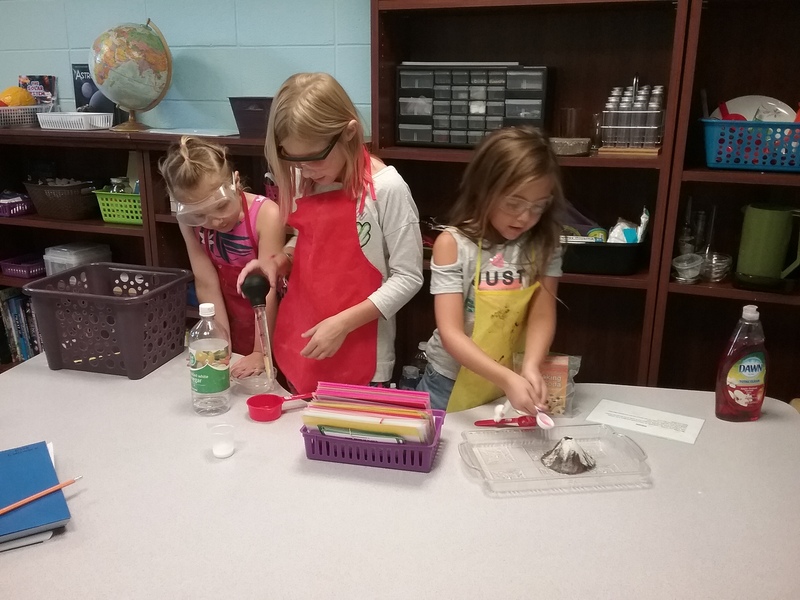 These first, fourth, and second grade girls are working together on our volcano experiment. In the elementary classroom, students are able to complete experiments on their own using experiment cards about anatomy, water, air, matter, and many other topics. 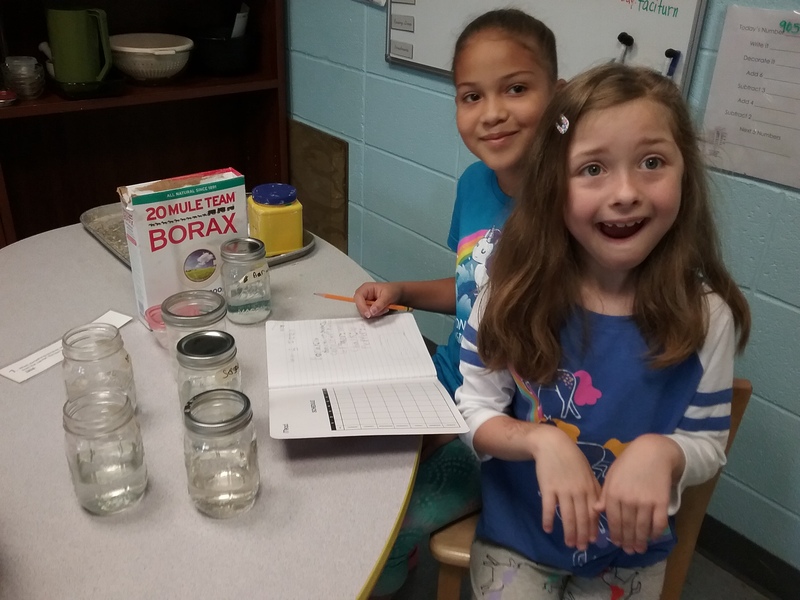 If students are interested in discovering something we don’t have written out, they are able to research an experiment or idea and write a material request if we do not have what they need. This is another opportunity for students to be creative while practicing the Scientific Method and learning to cooperate with others. These first grade girls have worked for two weeks on their wasp research! They used book and internet resources to write over a page of research. They also are making progress on a paper mache nest. To complete their report, they drew a picture of a wasp nest and added some laminated wasp specimens. They finally laminated their work and hung it near the nest so others could learn, too! Inspired by the ongoing research, this first year student is getting a closer look into the nest! Next week, we will begin our Spelling Assessments. The following week, we will begin our first Spelling lesson and homework! First year students will learn about the history of clocks, the noun, fractions, and the first plants. 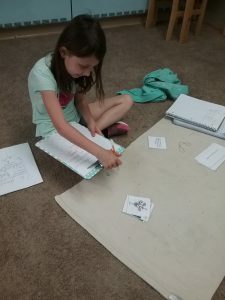 Second year students will practice greater than and less than, feminine and masculine nouns, the intersection of two straight lines, and work with our Animal Kingdom Chart. Our third year students will solve equations with the squares and cubes of numbers, will learn about suffixes, will begin their study with congruent figures, and will study the taxonomy of vertebrates. Fourth year students will review the commutative and distributive laws of multiplication, will begin advanced grammar studies, will continue their study of Pythagorean Theorem from last year, and will study basic life processes. Fifth year students will complete the Table of Pythagoras, will continue studying Native Americans, will study energy on earth, and will begin studying advanced botany. Our Ramseyer Farm Field Trip is Friday, September 21. Please make sure to turn in your permission slip! Sign ups are ready for “Bring Your Parent to ‘Work Time’.” You can sign up here. Posted on August 31, 2018 at 12:53 am. The first week of school is always one of my favorites. It is a time to welcome new friends, to catch up with old ones, and to see which children are almost as tall as me after a summer of growing. 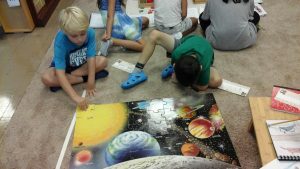 The first week, we always begin with “The Great Lessons.” These lessons were designed to give children an imaginative presentation of the beginnings of the universe, life on Earth, communication, numbers, and geometry. You can read more about “The Great Lessons” here. 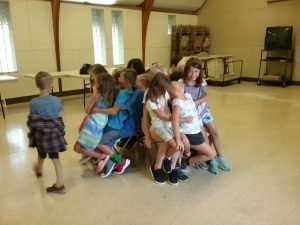 We also take a lot of time to build community during the first week. 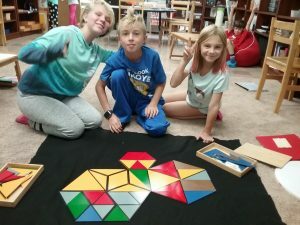 We play games together and have presentations from children of all ages to encourage collaboration and trust between all members of our classroom. Empowering students of all ages also enables children to feel confident in their ability to try something new before seeking help! We are so happy to have all of you back with us and are excited to learn more about our new families! 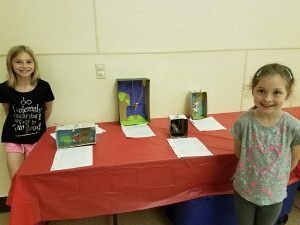 This year, the Upper Elementary students presented “The Great Lessons.” In these photos, the students are performing experiments to show what could have occurred during the Big Bang. 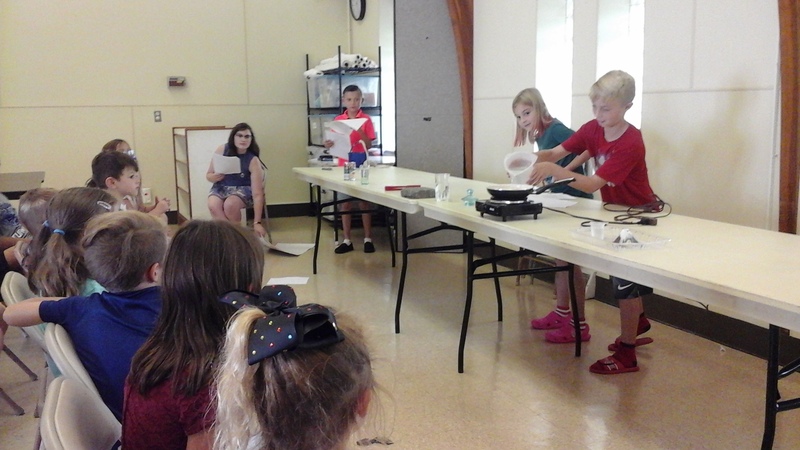 In the first photo, our fifth grade student is showing examples of the states of matter. In the second photo, a fourth year student is showing the change in water temperature on Earth using a hot plate. During the first week, we always have time together to present some lessons that our new students could choose. Our second year students become the “experts” and explain where to find the material, how to use it, how to record your work, and any other tips they think to share. If our first year students need assistance throughout the work cycle, they ask the expert that showed the work! This helps new students feel comfortable during work time, allows the second year students to take on the responsibility of being a role model, and builds friendships! Two of our first year students completed a puzzle of our solar system. They are using the magnifying glass for a closer look! A third year student is studying sentences by finding the subject, action, and direct and indirect objects. This material (Sentence Analysis) helps students become better writers by exposing them to many different sentence formats. All of our returning second and third year students have partnered up to explore the “Laws of the Universe.” These students are discovering which particles love each other and which do not. They have mixed different science materials with water and have observed which stay combined and which separate. They have created a poster stating the law and have included their results. Each pair will present their information next Friday! This third year student is trying to keep water in this bucket to experience the law of centrifugal force. This is always a favorite experiment at the beginning of the year! Inspired by the wasp nest hanging in our classroom, these first year students have spent the first week using books and the internet to research the life cycle of wasps. 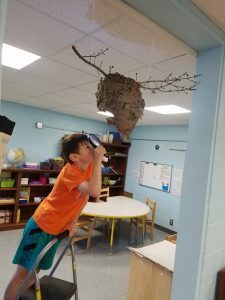 They have learned the color of wasp nests, what a wasp’s day is like, and are now making their own nest! Ask your child about the fun games we played! Next week we will begin a more typical schedule. 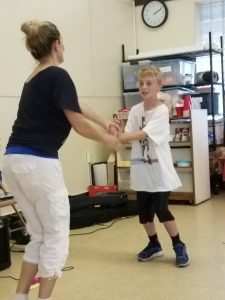 We will begin art, music, and gym enrichment classes! Students that did not have a reading assessment in August will complete one with me next week. We will continue some of our supplementary lessons to “The Great Lessons.” We will discuss “The Story of Geometry” and “The Story of the Babylonians” to learn about rope stretchers in Egypt and the degree symbol. We will have our first Teacher-Student Conferences Friday. Please refer to the “Meet the Teacher Review” email if you need a reminder about these conferences! Friday, September 7 – First Gym Classes – Bring a water bottle and tennis shoes! “Bring Your Parent to ‘Work Time'” – Learn more and sign up here. Posted on May 31, 2018 at 11:35 pm. This week we spent most mornings sharing different creations. 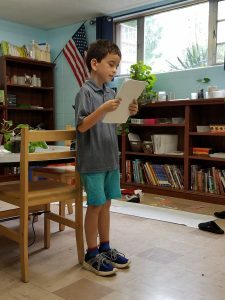 First graders shared their astronomer and planet research, second, third, and fourth year students shared their Imaginary Islands and the history of those islands, third year students shared their “Build My Block” geometry projects, and our fourth year student shared his Early Human Research Report that he has been writing throughout the year. It is wonderful to see the difference in quality and imagination in projects, as well as with public speaking, from the beginning of the year to the end of the year. These third year students are showing their classmates the Imaginary Islands they created. 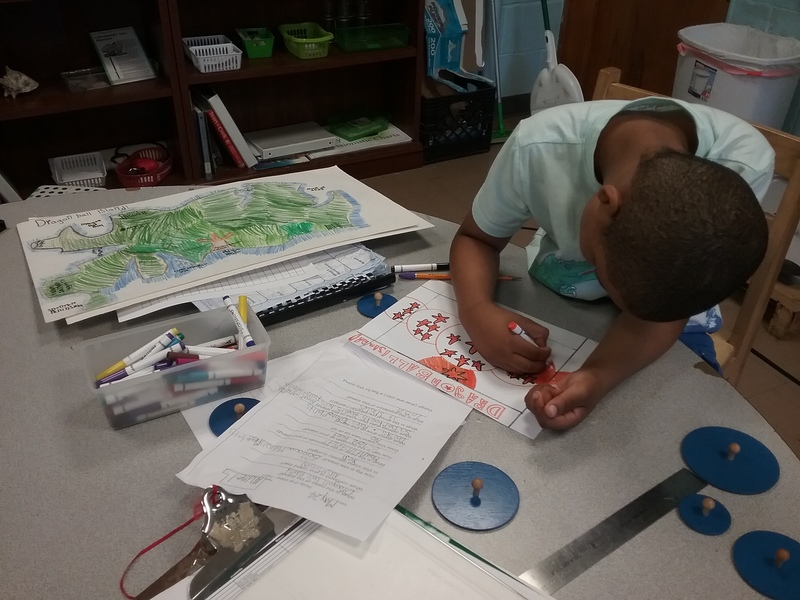 Each student needed to use their knowledge of geographic features to make an island that included ten features around the coast and at least five features inside their island. Each student then needed to view aerial photos of islands to make sure they were shading their island correctly. Students then wrote histories of how their islands were discovered and provided more information about the features of their islands. 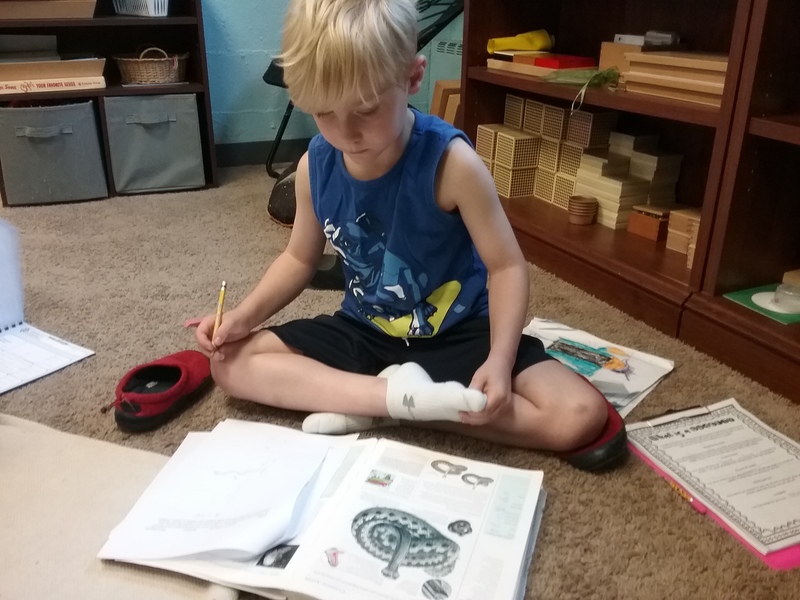 Throughout the fourth grade year, students study Early Humans. This student has studied Australopithecines through Homo sapiens. While discussing each group of humans, he compiled information he had learned. 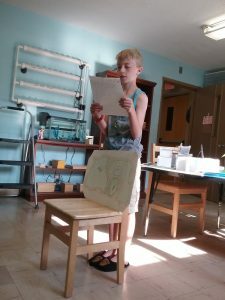 After studying Homo sapiens, he combined all of his information into a research report along with drawings of the tools these groups of humans used. Throughout their first grade year, these students studied the planets in our solar system. At the end of their planet research, each student chose an astronomer to learn more about. Students chose astronomers like Ptolemy, Aristarchus, Copernicus, Kepler, and Galileo. 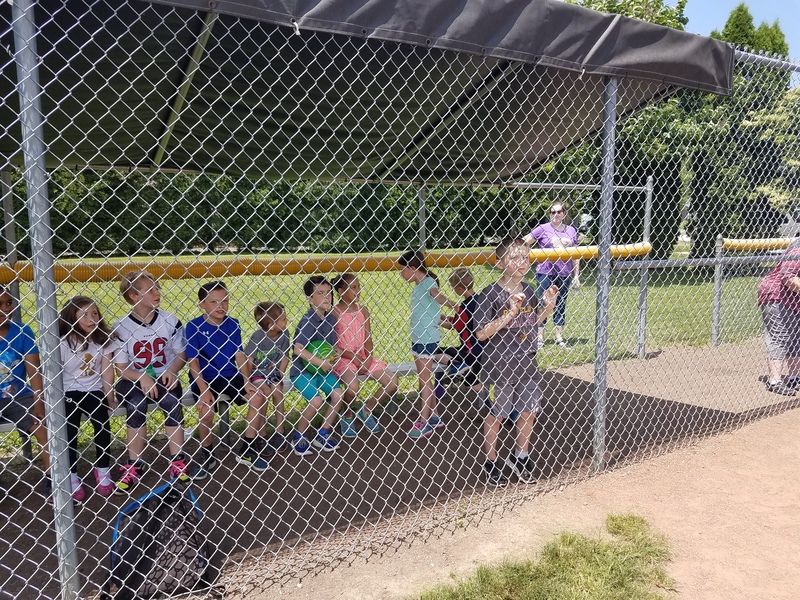 We had SO much fun at Field Day. Thank you, parents, for making an event like this possible! We couldn’t have done it without you. Although it is sad to say goodbye to some friends for a few months and some for a little longer, it is such a pleasure to spend so much time with all of your children. I learn something new every single day from your children and know they are going to make our world a better place. Have a wonderful summer! Posted on May 25, 2018 at 9:12 pm. We just wrapped up our final full week of the school year! We can’t believe it! This week the first years started a chart to share all their knowledge of the external characteristics of vertebrates and invertebrates. The second year students completed their polygon and circle studies. The third years are compiling their knowledge of the internal systems of vertebrates and have completed their “Build My Block” geometry project. The fourth years completed their study of fungi and are ready to share their Early Humans Research! These third year students learned the history of the Roman Arch and which previous civilizations had the idea, but not the technology. 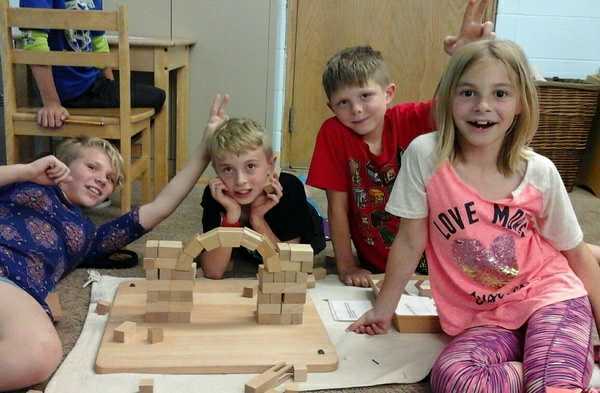 These students found different structures that use a Roman Arch and researched them. 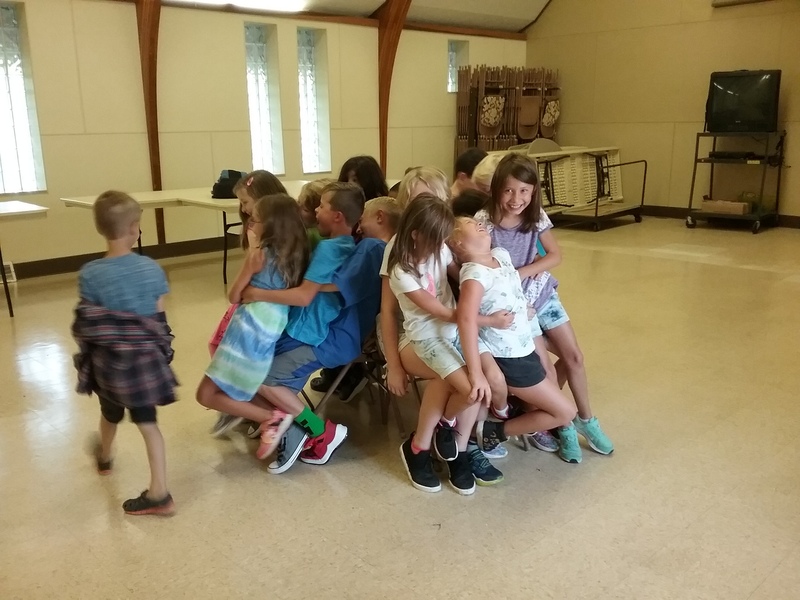 It took many, many attempts, but they were finally able to build the Arch with teamwork! At the end of each year, we complete Writer’s Workshop with an Autobiography and a self-portrait. Last year our self-portraits were similar to Minecraft characters. 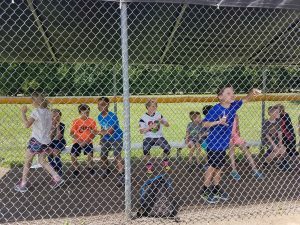 This year, we made self-portrait dioramas with each student on a swing! Make sure to check out our different designs and backgrounds! This student is researching about an adder. Research in the Elementary classroom is a great way for students to find out information about things they are interested in, while incorporating many different areas of the classroom. 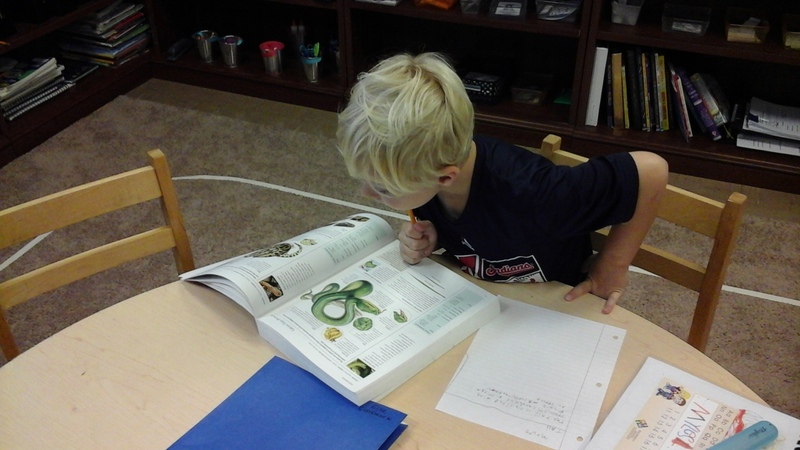 While studying Biology, this student is also improving his language skills! Our second year students are finishing up many projects. This student is working on a book about flower placement and flower arrangement. 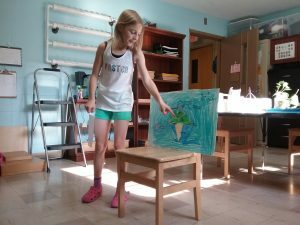 She learned how flowers are arranged on a single stem and on many different plants. Her book can be used as a guide throughout her other Botany studies! Our second year students finished out their circle research this week. 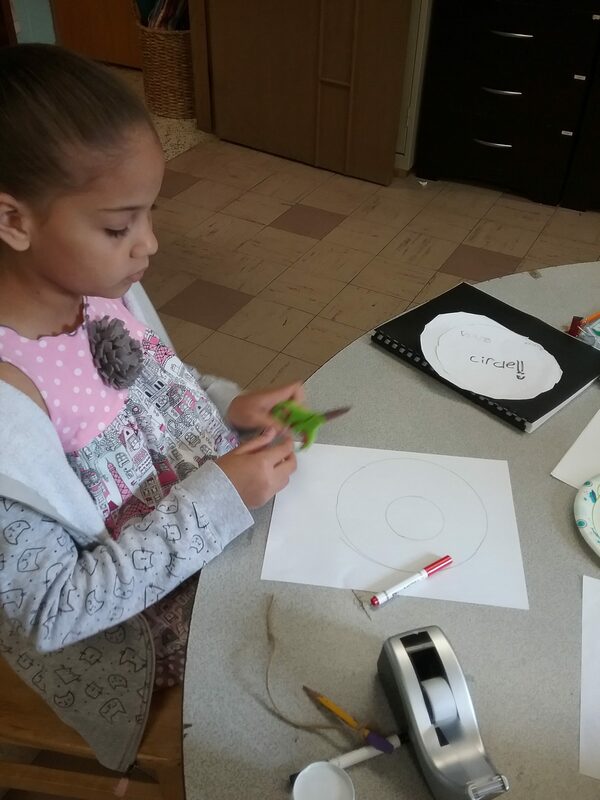 Last week they learned the parts of the circle and are making books to show the parts. This week, they also learned the different relationships between a line and the circumference of a circle. 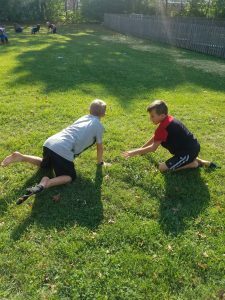 After studying different geographic features, our second, third, and fourth year students designed an imaginary island. Each student had to include ten geographic features around the coast of their island, five features inside, and a capital city. 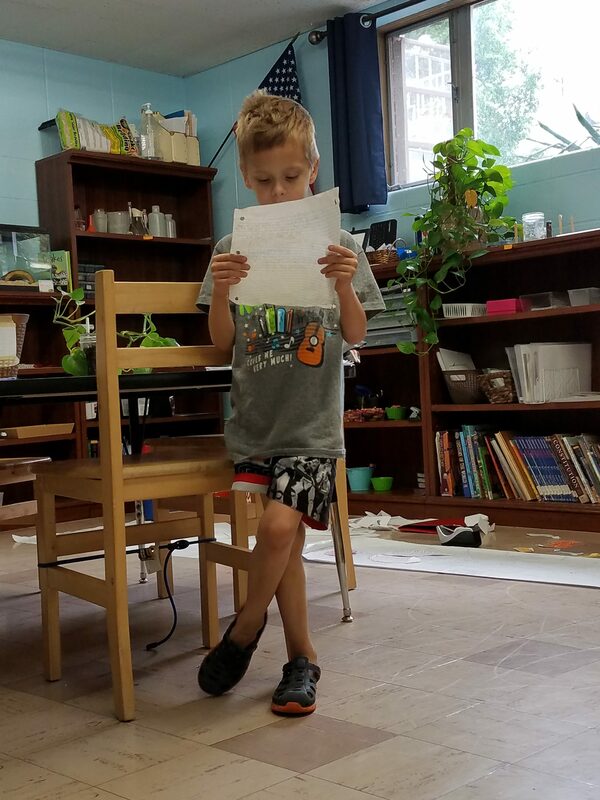 Our students each wrote a history of their island to explain where it is, how it was founded, and who the inhabitants are. This student also decided to make a flag for his island! Next week we will present many of the projects we have been working on. Our fourth year student will share his Early Humans Research and Tools. Our second, third, and fourth year students will present their Imaginary Islands. 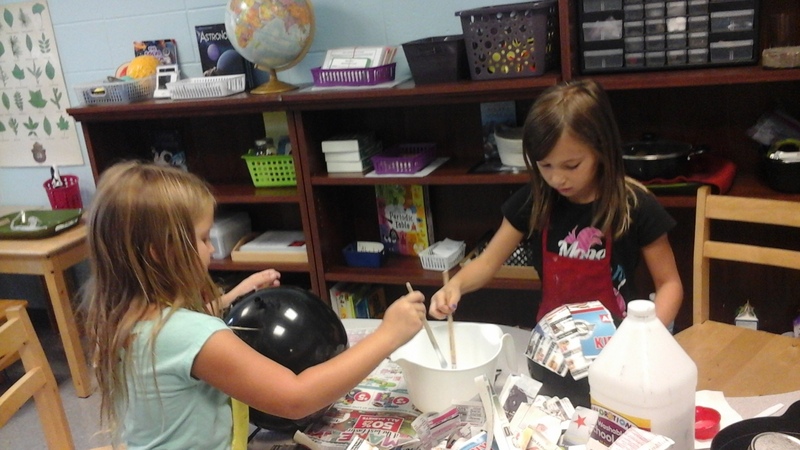 Our first grade students will present their planet and astronomer research with the help of a kindergarten friend! We will continue to work on estimating length, geometry command cards, and fourth years will finish studying fungi! This is also Field Day. Please refer to your email for the schedule of events and the changes in the event of rain. Please let me know if you are attending if you haven’t already. Posted on May 18, 2018 at 6:28 pm. 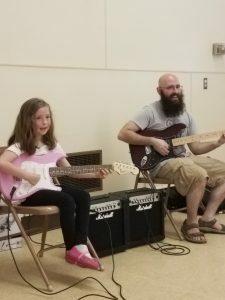 This week our “Peek” was written by two of our students! These students read our previous blogs, took pictures around the room, and filled in a blog template. The students did some editing together and with a teacher so what you will read below is their final product. There are still some misspelled words in their final product, but in a Montessori classroom we focus on the process, instead of the end result. 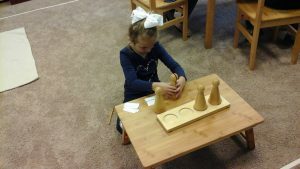 Dr. Montessori believed when we put all of the emphasis on the final product, we devalue everything leading up to that point. This can discourage repetition which will make mastery of a skill difficult. 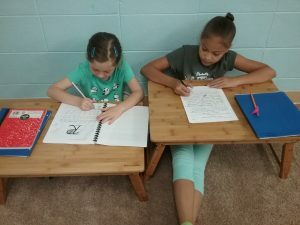 The purpose of the students writing the blog is to provide you with a glimpse into the room through their eyes, to provide them with practice of real world skills, and to give them a deeper understanding of the materials in the room. We hope you enjoy their work! (Ainsley) This week we researched and wrote the taxonome of all the animals in the school, including a Wolf Spiter that Ms. Courtney found. This year the 3rd graders have been learning a lot of main characteristics and internal systems of animals. We learned a lot about different and most common pets. Taxonomy of Earthworm Kingdom: Animalia Phylum: Annelida Class: Oligochaeta Order: Megadrilacea Family: Lumbricidae Genus and Species: Lumbricus terrestris Fun Fact: Earthworms don’t have eyes. Taxonomy of Painted Lady Butterfly Kingdom: Animalia Phylum: Arthropoda Class: Insecta Order: Lepidoptera Family: Nymphalidae Genus and Species: Vanessa cardui Ms. Courtney will have Painted Lady Butterflies in a few weeks! Taxonomy of Mystery Snail Kingdom: Animalia Phylum: Mollusca Class: Gastropoda Order: Caenogastropoda Family: Viviparidae Genus and Species: Bellamya chinensis Fun Fact: Male and female snails can reproduce by themselves. They reproduce asexually. 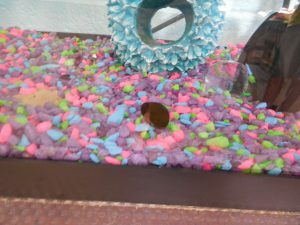 Taxonomy of Tuxedo Guppy Kingdom: Animalia Phylum: Chordata Class: Actinopterygii Order: Cyprinodontiformes Family: Poecilidae Genus and Species: Poecilia retiuculata Fun Fact: Guppies have gills to filter they water so they can live in it and still get oxygen. 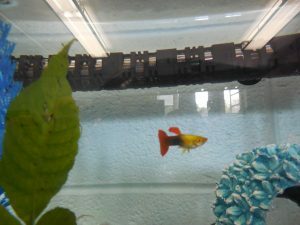 Taxonomy of Betta Fish Kingdom: Animalia Phylum: Chordata Class: Teleostei Order: Perciformes Family: Osphronemidae Genus and Species: Betta splendens Fun Fact: Betta fish jaws are stronger than a Great White Shark. Taxonomy of Chicken Kingdom: Animalia Phylum: Chordata Class: Aves Order: Galliformes Family: Phasianidae Genus and Species: Gallus gallus Fun Fact: Chickens don’t have teeth! 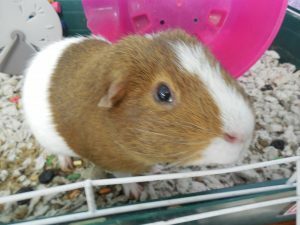 Taxonomy of Guinea Pig Kingdom: Animalia Phylum: Chordata Class: Mammalia Order: Rodentia Family: Caviidae Genus and Species: Cavia porcellus Fun Fact: Guinea pigs have tails. The tails are under their fur. Next week will be our final full week of school! We will have Spelling Assessments Monday and Reading Assessments throughout the week. There will be no new Spelling homework, but please continue to have your child read and record their work on their reading log. 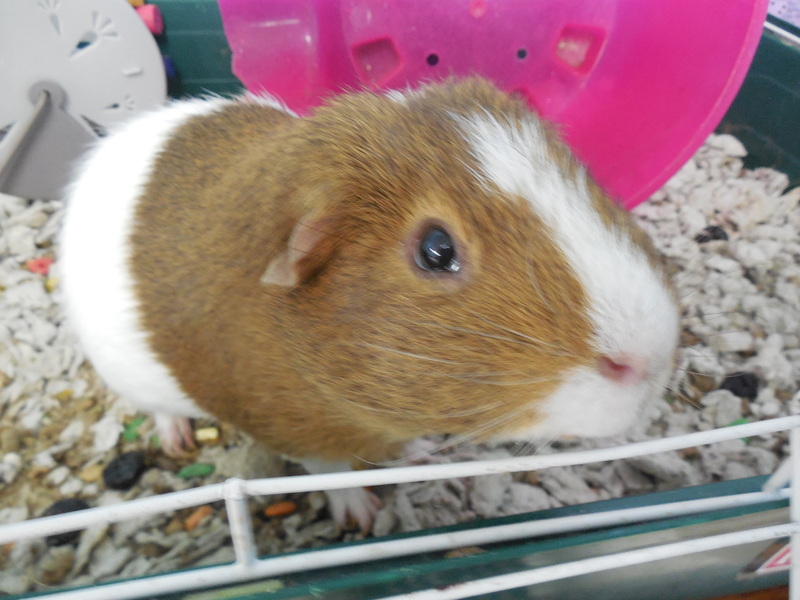 Next week Lower Elementary students will add and subtract lengths, add and subtract squares and cubes, practice budgeting, learn more about circles, and complete some research charts as a Zoology review, where we will continue to study about different pets and how to maintain them properly. Since this week we focused more on chickens, next week it will be more about rabbits; since this was a popular pet among our classmates and share how difficult finding a suitable home for your rabbit can be. 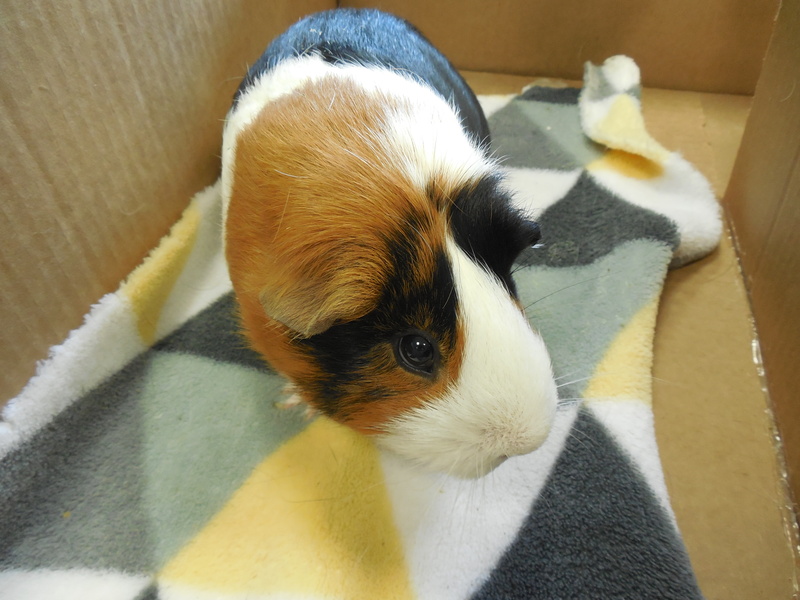 We will learn that a decent sized rabbit hutch is a good start and how to find the right one. Taking care of these pets can be pretty delicate but with the help of the class mates that already owns one, we’ll cover all of their specific needs in order to help them live a long, happy, and healthy life and many other fun facts about them.